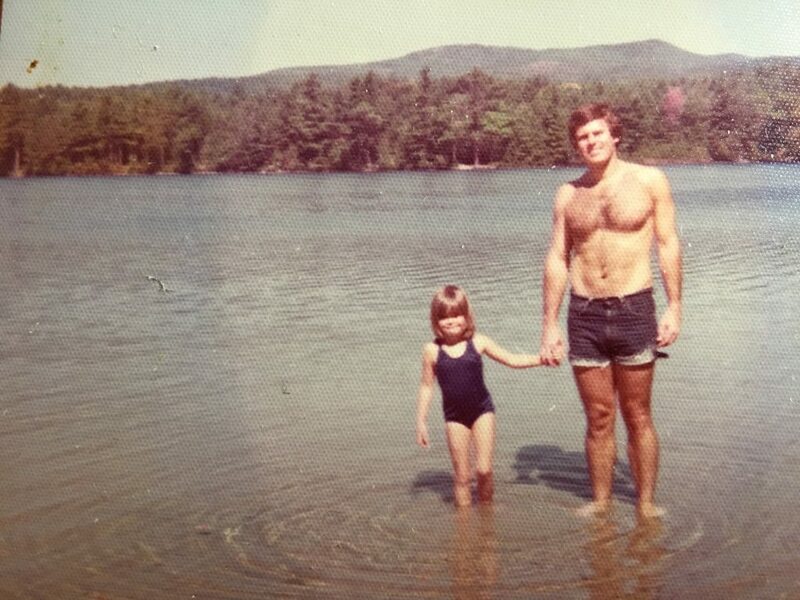 When my dad passed away almost a year and a half ago I nominated Rocking the Boat to be his memorial charity — he loved the water and boating, NYC, and the idea of helping kids navigate the future — it just seemed a perfect way to honor him. My family and I landed on another admirable effort, but it’s nagged me since that Rocking the Boat was also such a good fit. 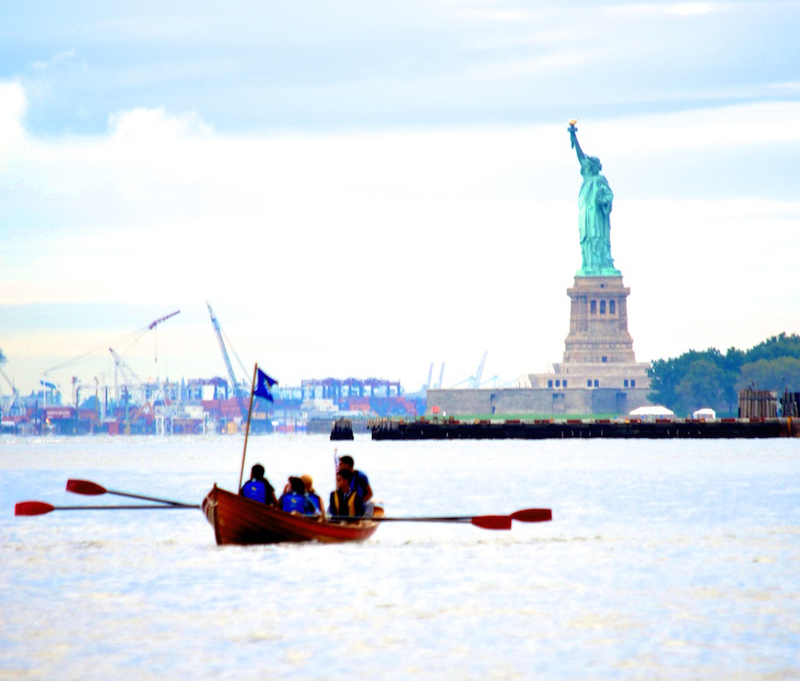 And so, it’s with pride (and filled with the spirit of love) that I’m undertaking a row around Manhattan at the end of the month to raise funds for Rocking the Boat. 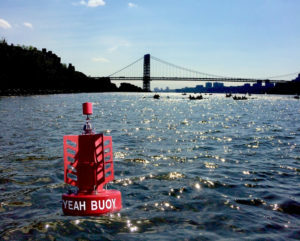 On September 29 (only 10 DAYS from now), my “Yeah Buoy” teammates and I will row a Whitehall around the entire island of Manhattan — that’s 30 miles in one day! 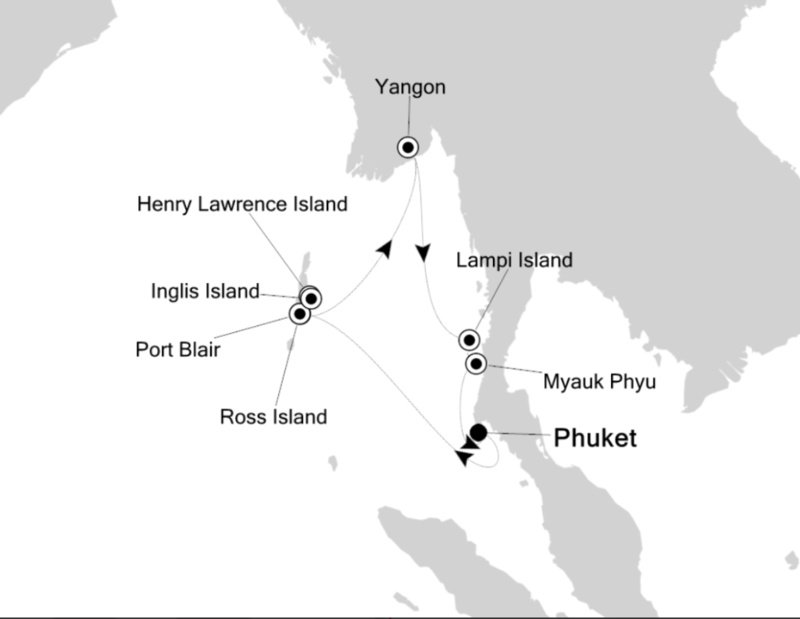 We’ll be dodging ferries and water taxis, navigating the strong tides and city bridges while guided around the island by a program graduate as our coxswain. I recognize that all of us receive countless pleas for financial support these days, especially with the rise of progressive politicians who snub corporate-based funding and lobbies as a vehicle to win elections. I embrace this direction in politics, but also recognize that it means that all that much more when you take the time to make a donation to this cause. 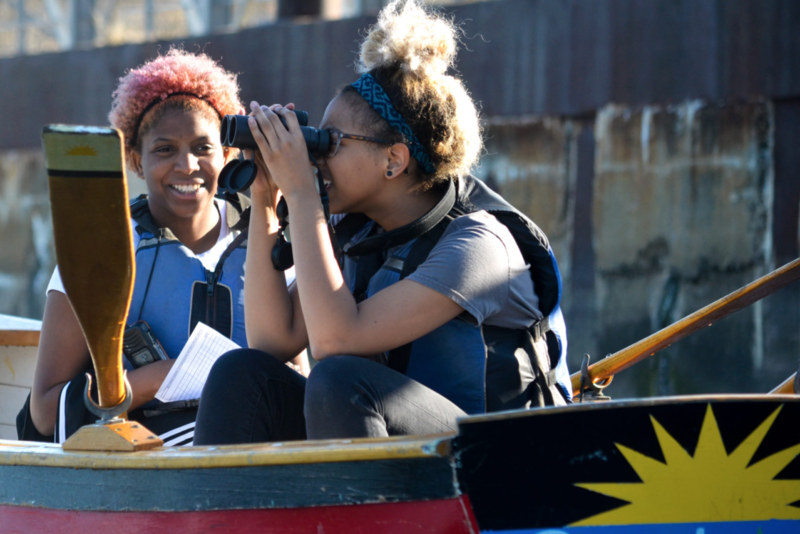 Your contribution (big or small) supports this admirable program, supports the initiative these kids are taking to build themselves as they build boats, supports my “Yeah Buoy” team, and supports me personally in my effort to uphold the memory of my dad; the great man and member of the NYC community that he was for so much of his life. Contribute now and help me close the gap on the last $1000 needed to reach my $2000 goal! 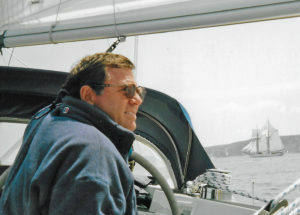 At the core of this undertaking, I will be rowing and ‘Rocking Manhattan’ because my efforts will support Rocking the Boat’s vital programs for young people growing up in very difficult circumstances, and I will be wearing my dad’s old sailing gloves every stroke of the way around Manhattan. I’ve come to understand in the early days of 2018, that this capacious word embodies the simple act of inhaling, the source of creativity, and ultimately guidance from a divine power. In the literal sense ‘inspiration’ means to breathe in – an inspiration and an expiration occurring in each cycle of breath. In the modern figurative sense it refers to someone or something that inspires us. But Merriam Webster says, “before inspiration was used to refer to breath it had a distinctly theological meaning…referring to a divine influence upon a person, from a divine entity….” This is the original meaning of the word from the early 14th century. The word ‘inspiration’ strikes me as significant. Its definitions ricochet from my right brain to my left and back again leaving me wondering how a word that I’ve been offhandedly tossing around all these years could hold such gravitas. 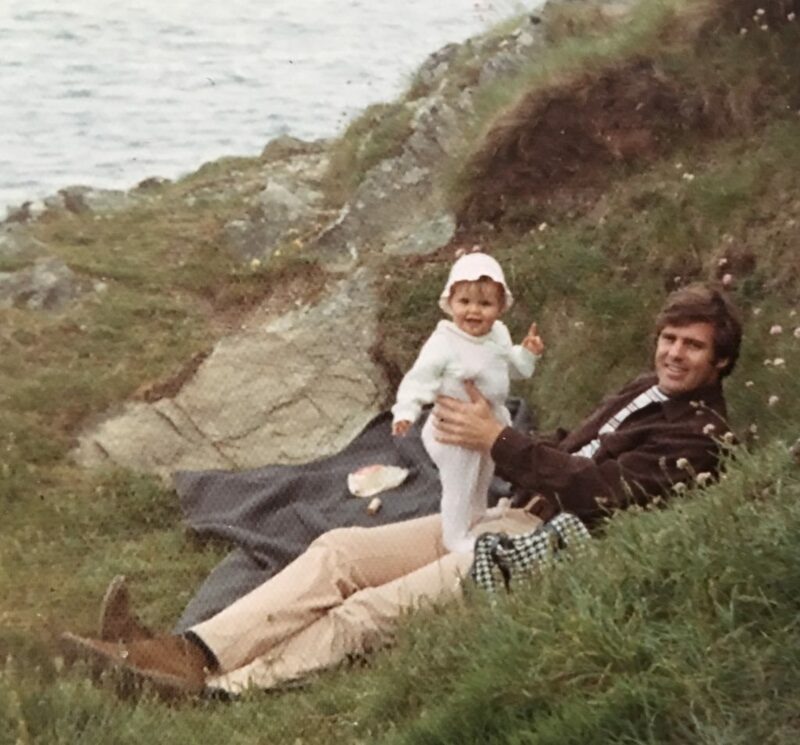 One solid year of dedicated meditation since my dad was diagnosed with incurable cancer has imbedded in me a profound respect for the simple necessity of inspirations and the rhythm of breathing. My analytical, science-attuned left-brain understands ‘inspiration’ and breath as a life force. In particular, the need to uptake air, to draw in a cocktail of chemicals including oxygen that literally feeds our bodies and sustains life. And the cleanest air on earth to imbibe? I’ve just returned from the Circumpolar Current-insulated continent that is Antarctica. Surely that southern air is the most nourishing I’ve been lucky enough to sample thus far. Its purity is unmistakable and it’s salty, chilled aftertaste smacks of vitality. 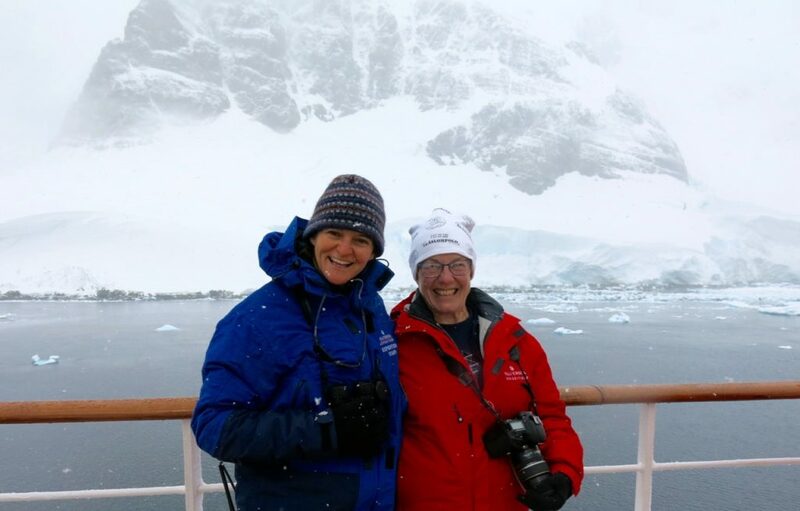 In the Lemaire Channel with fellow traveler and dear friend Di Patterson. It was a joy to voyage together again! 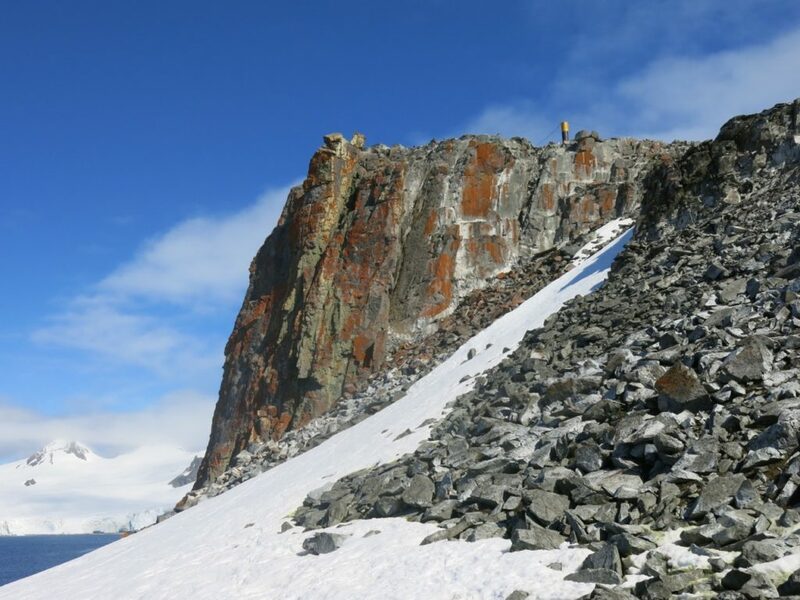 The features of Antarctica are at once legendary and legends of geography, geology, biology and history that viscerally inspire me to keep reading and learning and teaching. It becomes obvious at the bottom of the world that there is always more to know and share. 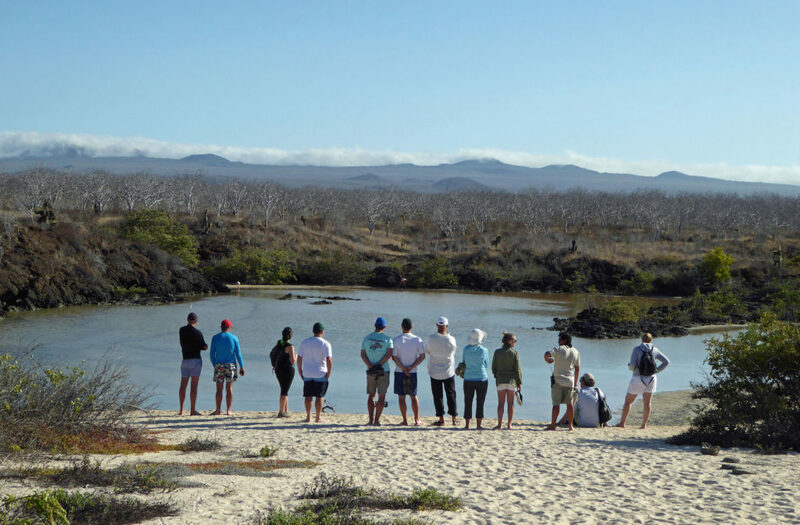 Breaking ground with the Silversea Expeditions Training Academy. 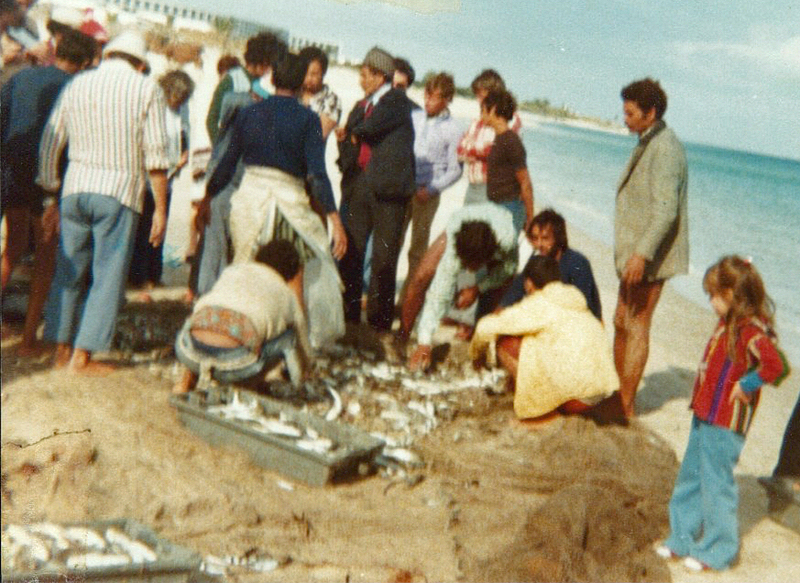 I want to dole out the best bits of knowledge like bait on so many hooks, string them into a lifetime of study and exploration, and keep my audiences hooked as I reel in the line. 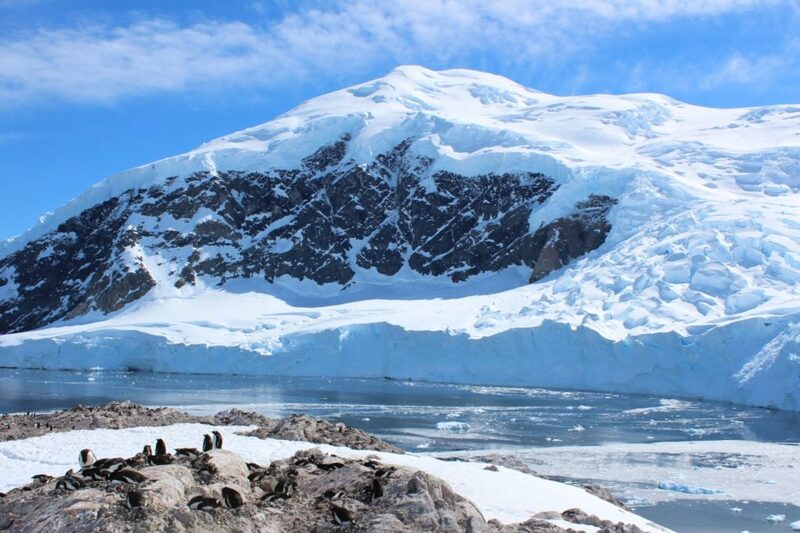 Tiny penguins in the foreground are engulfed by their ‘berg in the distance. 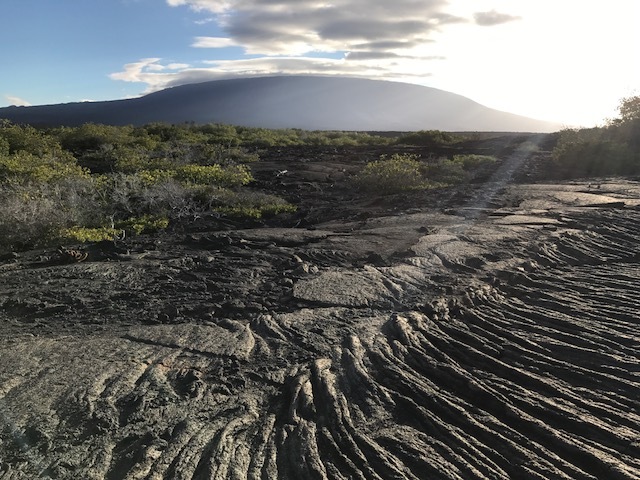 I am also inspired to write, to paint, to create, and sing the praises of one of the most threatened places on the planet. The beauty I have been lucky enough to see over the last nine weeks is ephemeral, and changing in front of my generation’s eyes. Deviations in climate, like trusses, now build a long tunnel with the clear light of finality shinning at the far end. People and penguins in red, black and white stretch along the beach. Finally, together let’s ponder the oldest meaning of the word ‘inspiration’ and come to understand independently how critically important it is to respect our differences in comprehension of the third and distinctly godly definition of the word. How does one discover and know divine influence? Where does each person’s divine entity reside? How profoundly does the divine influence each of us? What form does your divinity take? 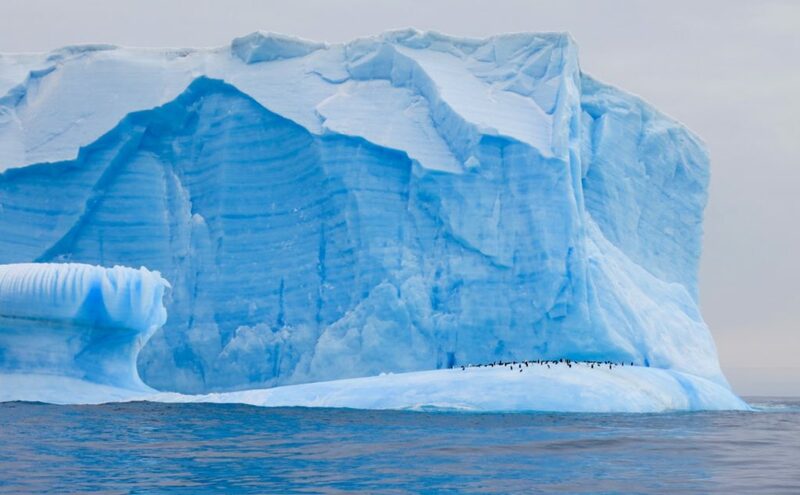 Are the steep, jagged, black, snow blasted slopes of Antarctic shores and the steel-blues of continental icebergs celestial enough for this brand of inspiration? Sending everyone much love and hopes for an inspirational 2018. 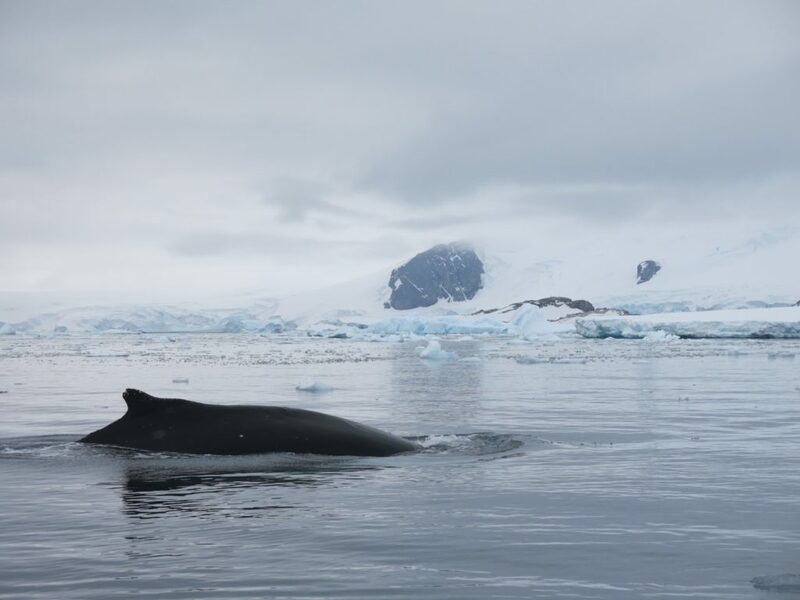 This entry was posted in Uncategorized and tagged Antarctica, climate change, expedition, expedition ship, heroic age of exploration, humpback whale, iceberg, King penguin, penguin, polar ice, South Georgia on January 13, 2018 by admin. 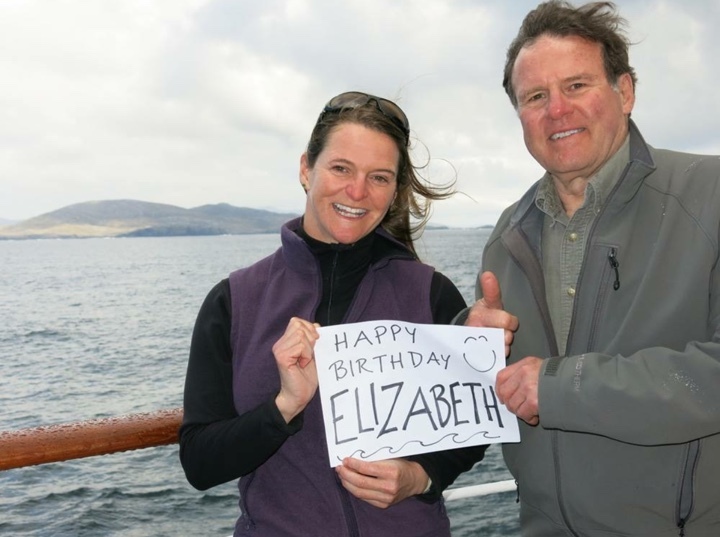 In a last minute flurry of opportunity I took my 13-year old niece to the Galapagos last month. What a joy to be back in the islands unlike any others on the planet, and to see it all unfold in front of new eyes without the burden of expectation. 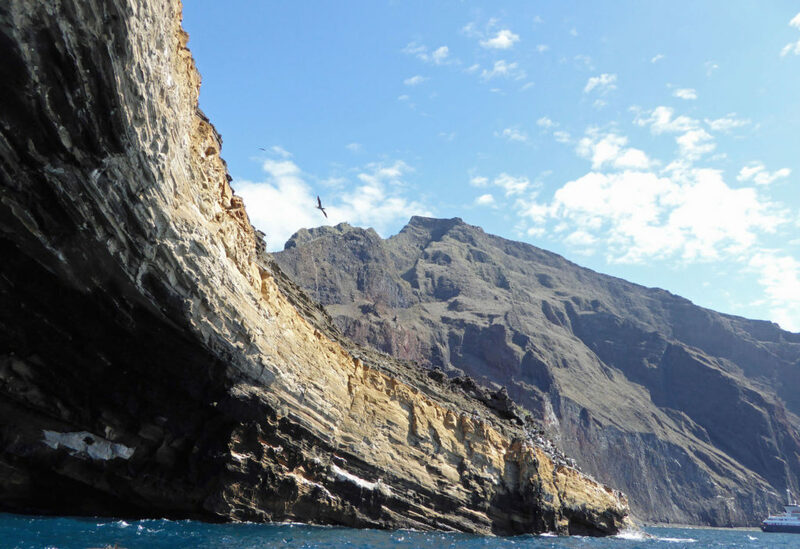 We took advantage of every opportunity to snorkel, hike, kayak, and land ashore. We took in sunsets over cold drinks (one virgin Piña Colada and a skinny Margarita please) and aboard a Zodiac cruising through twisted waterways of sheltered mangrove forest. 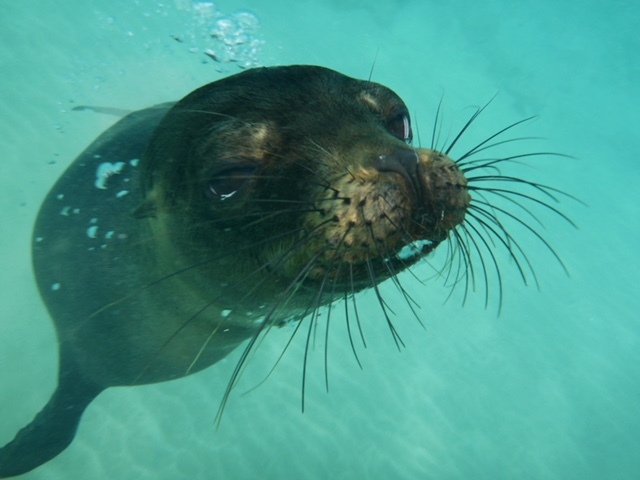 One early morning chilly snorkel paid us back for the commitment of entering the cold ocean with a single playful sea lion that cavorted and dove and somersaulted with us for a solid length of time. 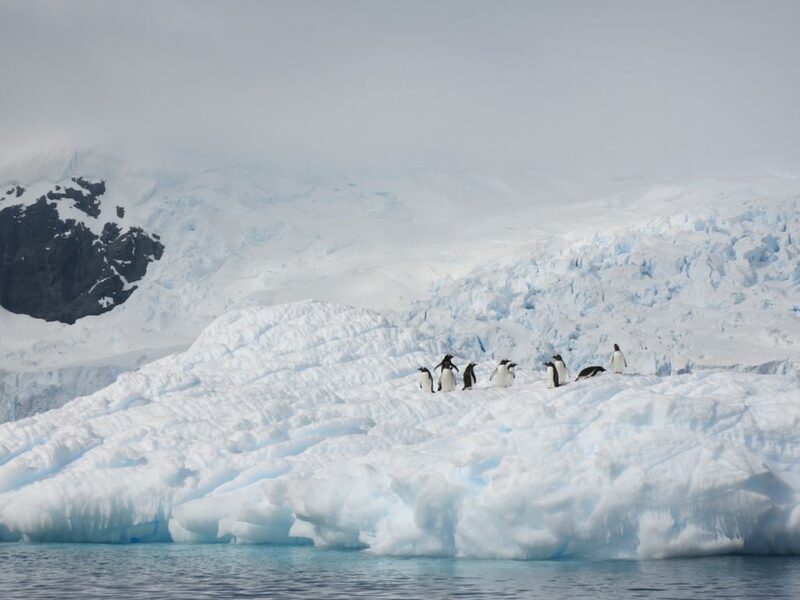 And sometimes we saw flocks of penguins “flying” by in the blue sea as we swam along. 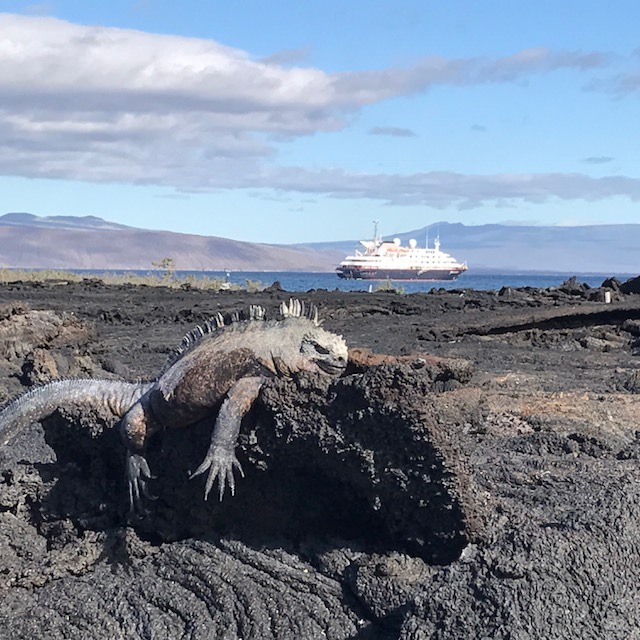 Sea turtles on shore and in the water kept us company and hundreds, if not thousands of marine iguanas decorated the shores we explored with our excellent group of informed and informative guides. I’m grateful for this spontaneous trip to the equator before I journey south to the Antarctic Peninsula next week. 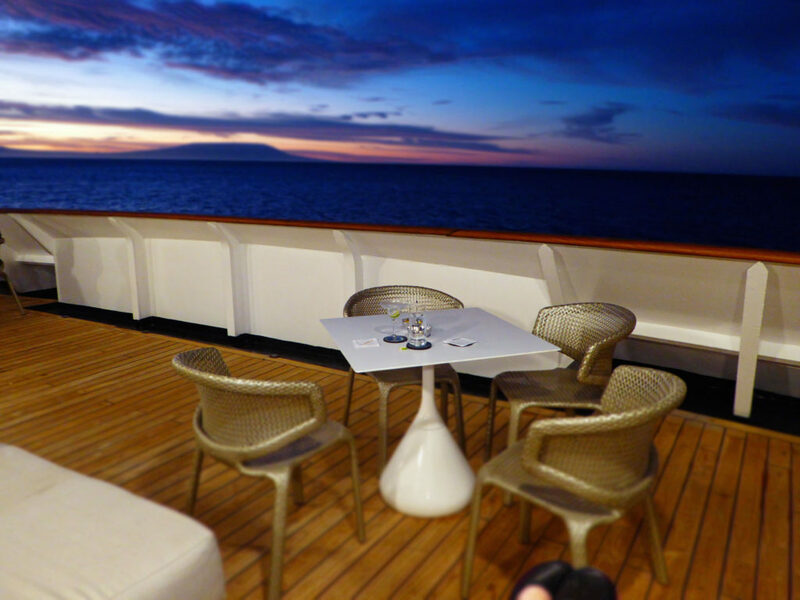 The sun and familiar surroundings were as comforting as the luxury of the ship and the special attention of all the crew. 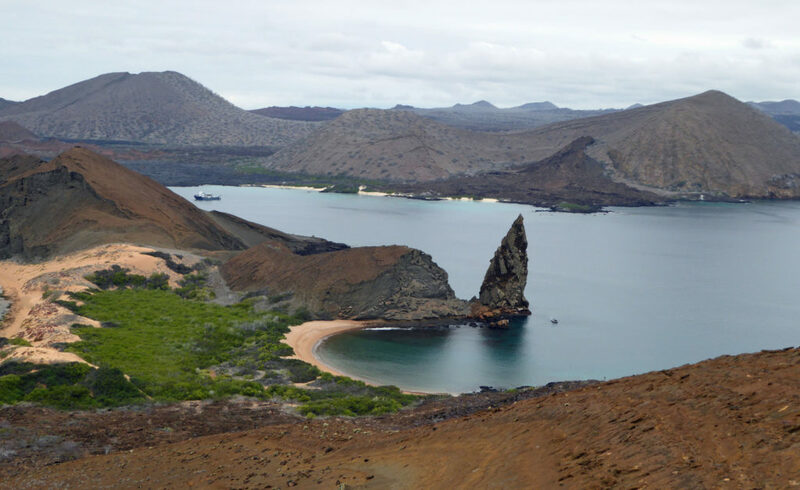 Being back in the Galapagos felt like being home. I’m sitting on a park bench in the south of France on the outskirts of the city of Monaco. The motivation to explore this new city is eluding me. I’m more attracted to the slow enjoyment of a café au lait on a small street corner, and to this shaded, quiet spot on a back street, half-way up a flight of steep steps rising from one twisted and narrow street to another above me. My drive to explore has been temporarily dampened. I suspect this is not permanent, but rather a side effect of the terrible loss I’ve endured this year. I flew home right away, rising above the Maldives’ endless shades of blues and greens, into the grey twilight of the unknown and onwards to my family’s home in the frigid, stark white of a New Hampshire winter. 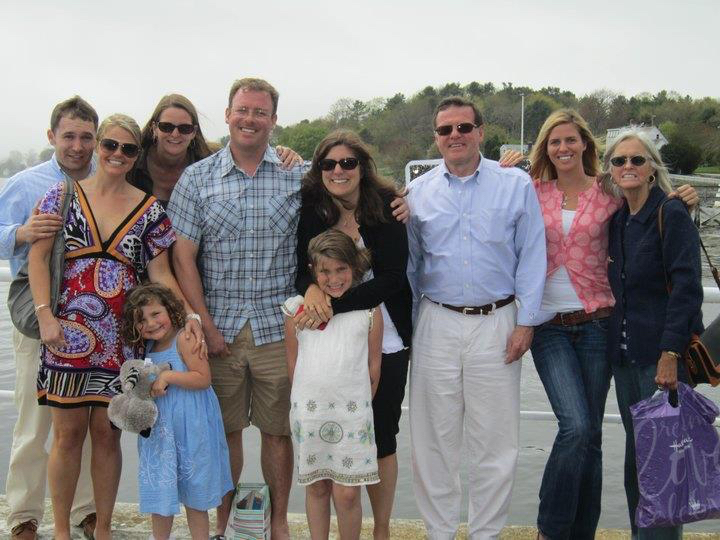 It was here, and after two tortuous biopsies, that we found out my father had Stage IV brain cancer. Let those words soak in for a moment. Think of the devastation and the sorrow and the heartbreak they carry. Think of the uncertainty, the fear, and the unknown consequences that they rain down onto a family. And it did rain. 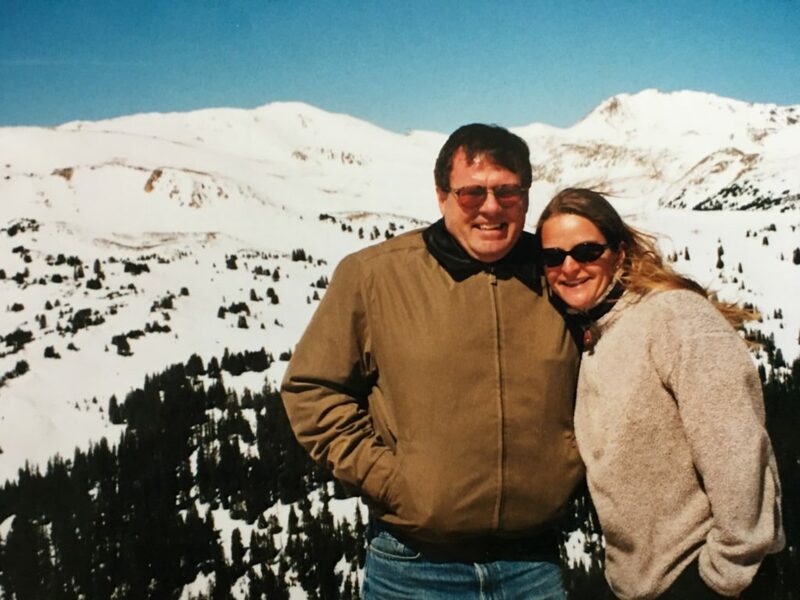 It was a monsoon of stress and worry wrapped up in the management of time, and radiation treatments, and chemotherapy drugs, and patient care, and doctor’s visits, and eventually long-term nursing homes. 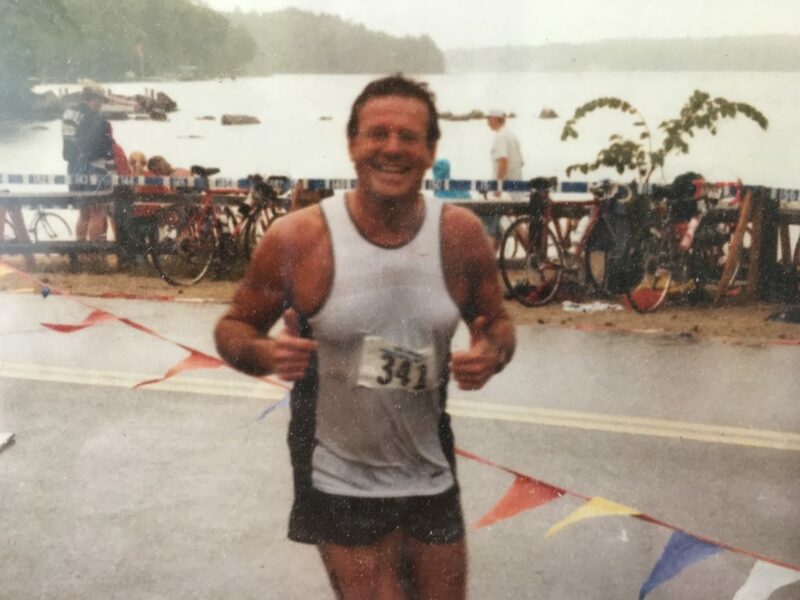 And all this for a 72-year old man, the anchor of our family, who was riding 50 miles on his bicycle without batting an eye, who went to the gym without fail every morning at 5:30 am, and who hiked with the dog every weekend. There was no apparent explanation for this torrent of raining misery, and no reason for the deluge, but it robbed me of my father in a slow, tortuous way that left us with nothing more than a shell of a man, half paralyzed in a hospital bed, unable to form sentences or follow his thoughts, unable to reflect on his life and his loves, and fixated on his last enjoyment in this world – food – namely ice cream and smoothies delivered by his doting adult children. 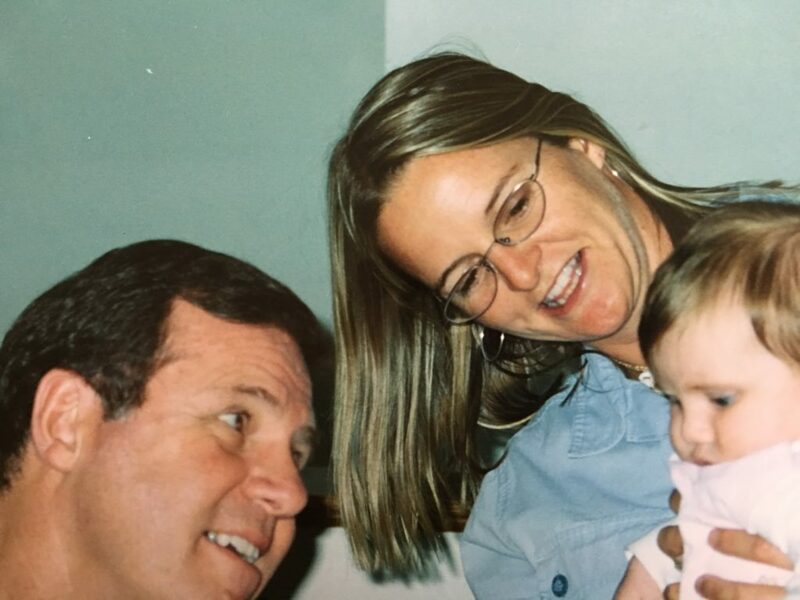 The experience of caring for my dad and watching him leave us, side-by-side with my family and close friends, has changed me forever. It’s brought me closer to my siblings and extended family, and it’s dragged me to the edge of my own capabilities. Before this happened, I thought my strengths and abilities were near limitless. I take away from this experience the knowledge that strength is an illusion and ‘grace under fire’ is the ultimate resilience. It is courageous and human to ask for help, and bold and admirable to accept it when offered. 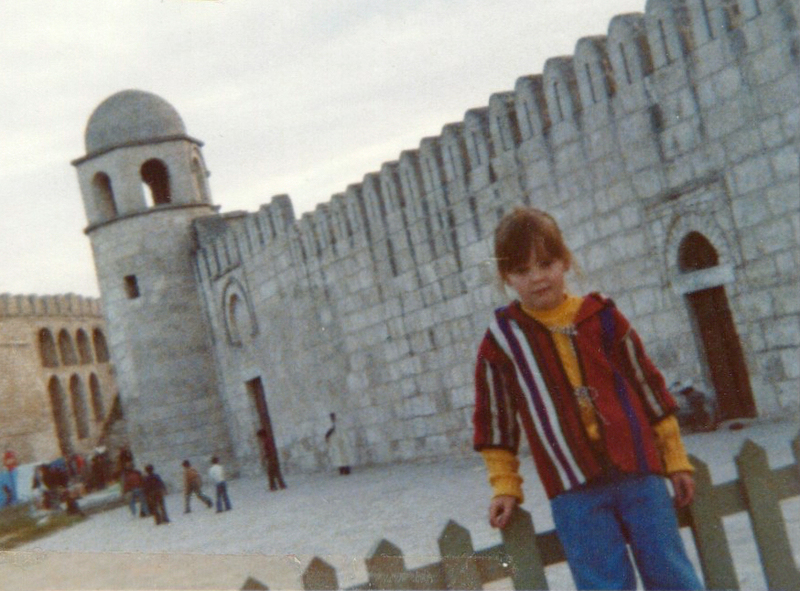 I know intimately now that even the most fortified of walls will crumble. And so now you know, dear reader, why I have been negligent in writing and have abandoned my travel posts and photos for some time. 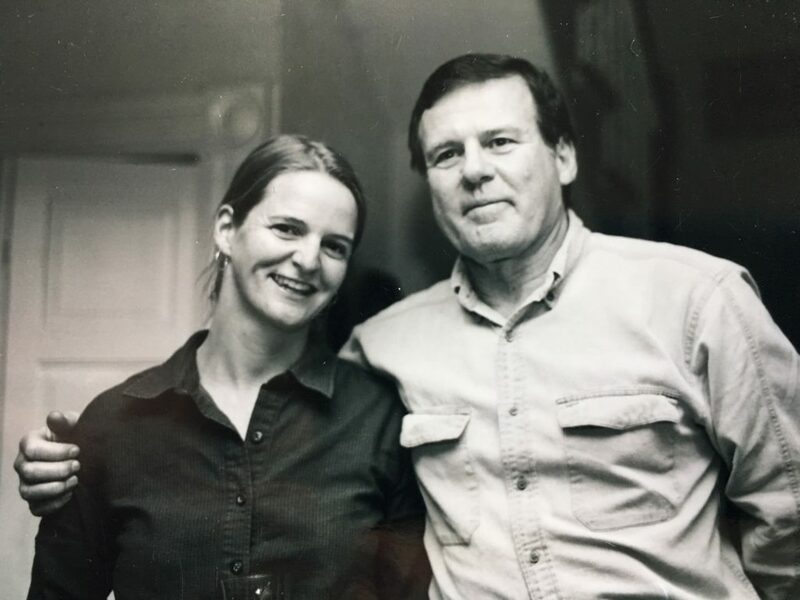 It’s taken me these four long months since my Dad slipped away in April, with a final whispered exhale, to find the space in my rain-soaked heart to write about his passing. He is the main reason I depend without hesitation on my inner moral compass, and find confidence in my gut feelings, and resilience to changes in my life. 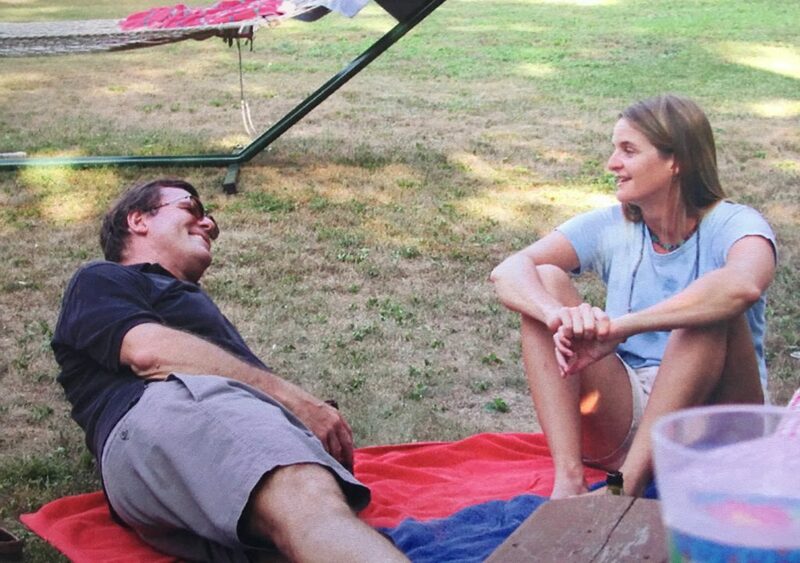 In large part it’s because he always trusted me, always knew I’d find my way, and never hesitated to give me every assurance that things play out the way they are meant to. It is frankly strange to travel without him now. Who do I share my stories with when I come home? Who will sit with me and watch the videos of wildlife encounters and far-flung cultural performances? Who will laugh with me about the sagas that played out on board the microcosm of the ship and the colorful characters involved? Who will be that unfailing, reliable landmark in my life? 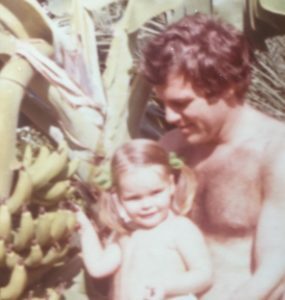 Of course, it will always be my dad. The conversations just take place in my heart now. 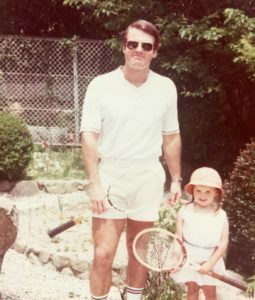 And I will continue to make him proud, and bring him stories, and he will know that my horizons are broad and only getting wider. Welcome to the Women’s Adventure Expo! We are the first adventure and travel expo in the UK dedicated to women. We are also a pioneering social enterprise empowering women who are interested in, or engaged in, adventure and exploration. We are commited to the growth of a positive global platform which celebrates and inspires women through adventure. We believe in making adventure accessible and inclusive to all women no matter what age, ability and stage of life. By connecting people, supporting one another and encouraging women to challenge themselves, we aim to raise awareness for, and collaborate with, projects that harness ethical purpose and create opportunities to expand our social value. Keep reading to find out more. 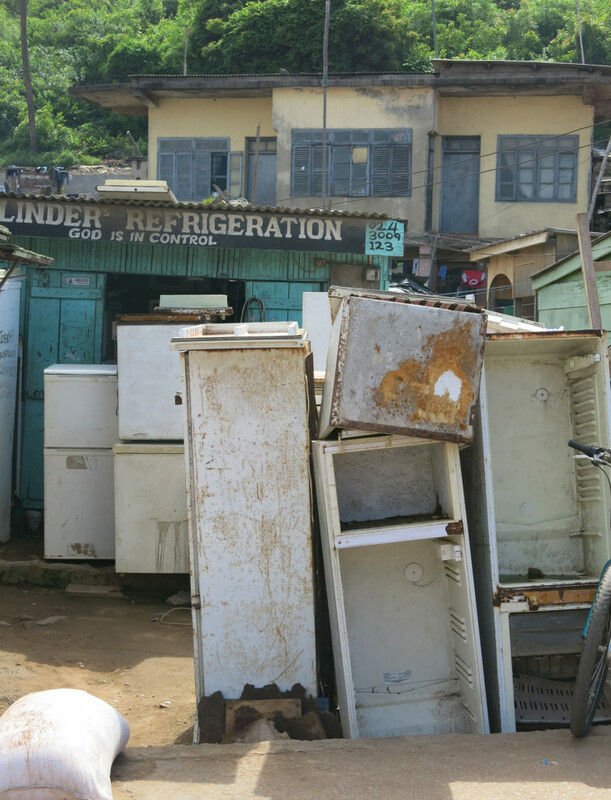 In West Africa, commerce thrives on the side of the road. For 4 weeks now I have spent many hours driving along hundreds of miles of these roads in all their various states of repair and disarray, and I can safely say that almost everywhere there is a road, there is a market. 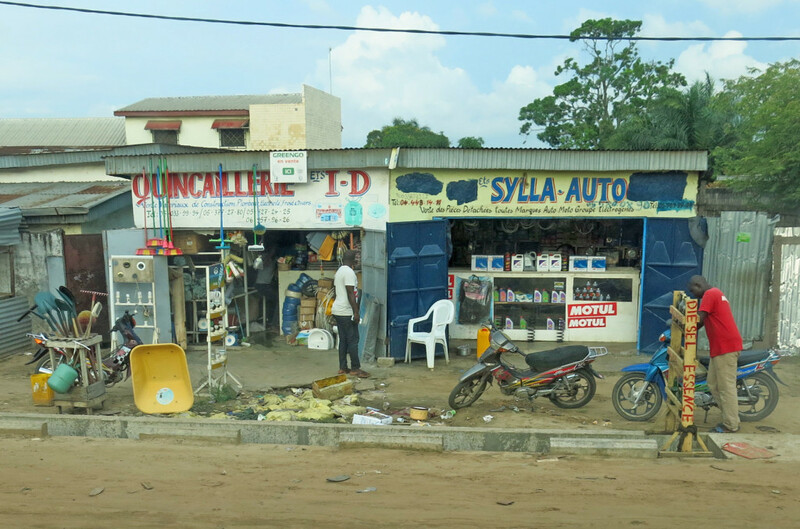 In West Africa, you can buy just about anything you want or need on the side of the road. Thanks to the markets, hundreds of people are coming and going by bus, car, taxi, moped, or donkey-drawn cart at all hours of the day. To entertain myself on these long drives along the Africa coasts, I made an incomplete list of some of the goodies for sale. 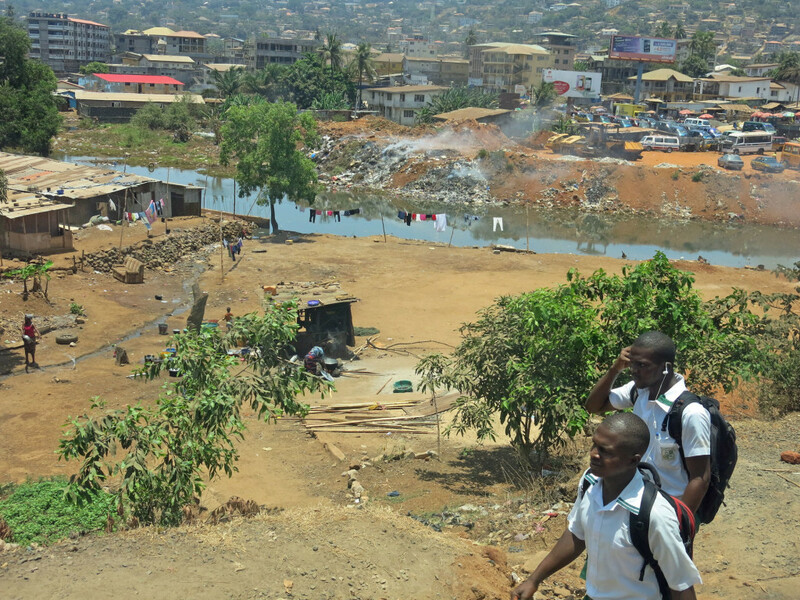 Students walk home on the Sierra Leone roadside as piles of trash smolder on the riverbank behind them. 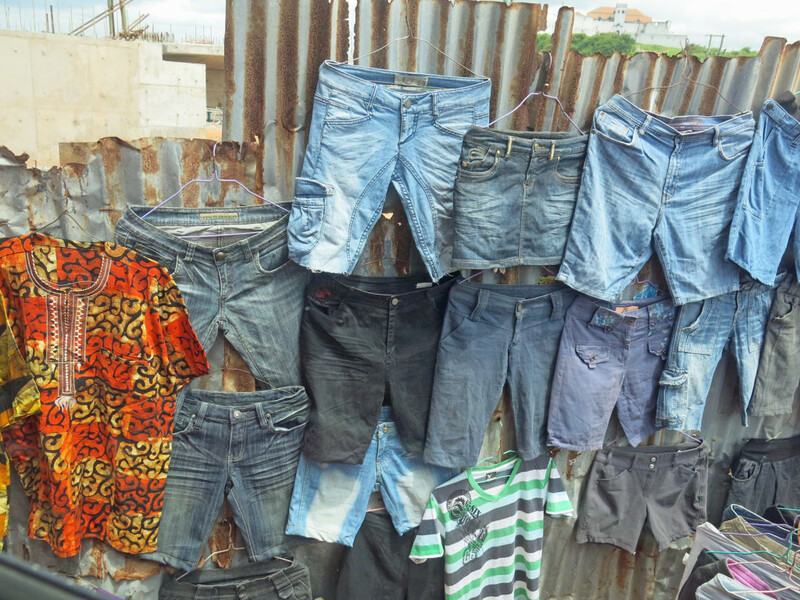 Most clothes for sale in West Africa are second hand. No doubt donations from the first world. 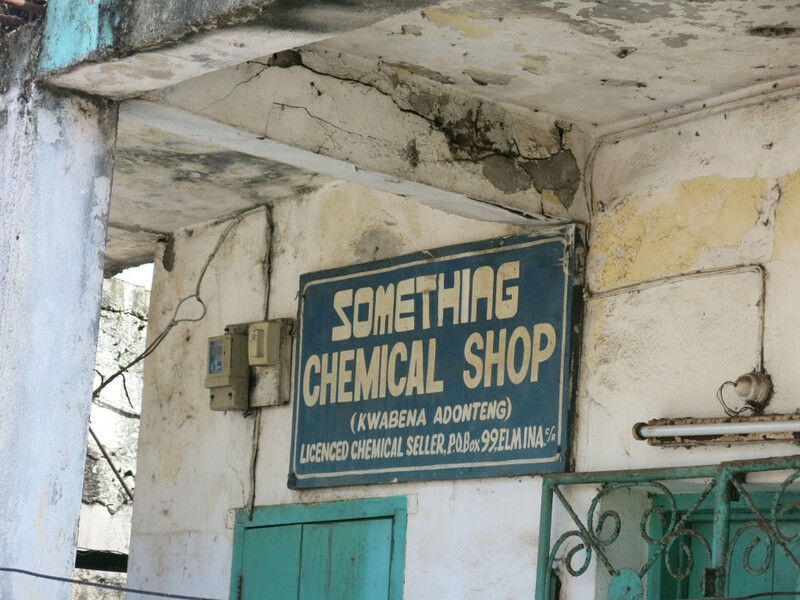 Not sure what is being sold out of this store front in Ghana. 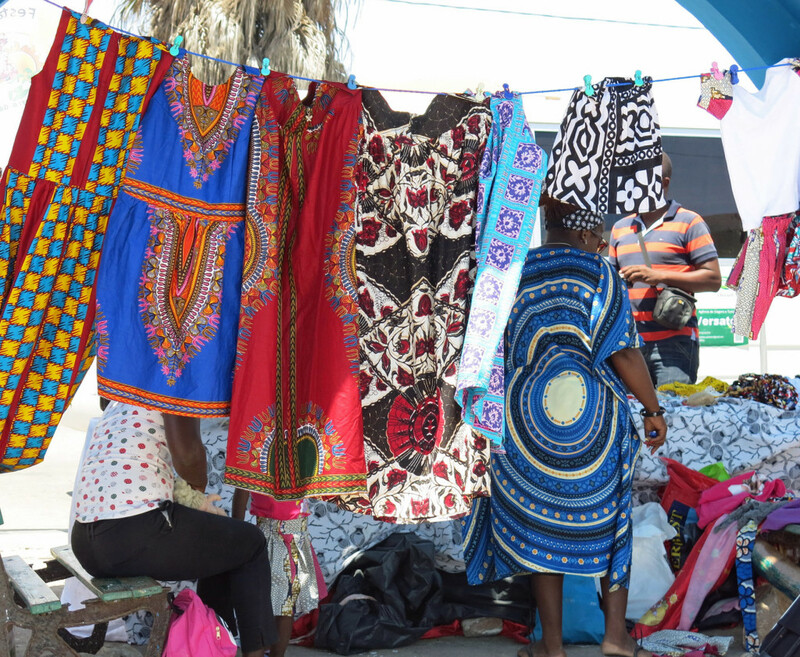 Sampling of the brilliant fabrics and clothes for sale. 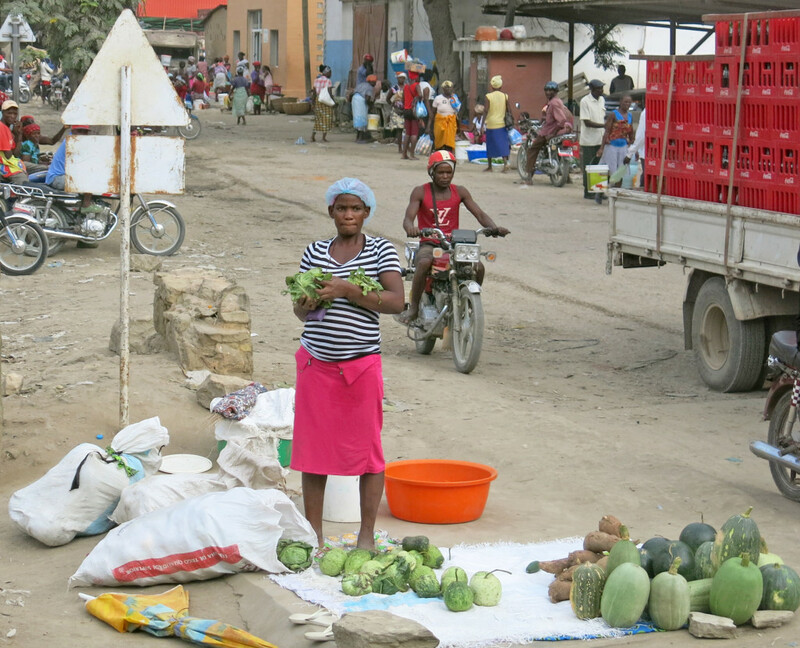 Woman selling cabbage, squash, and yams in Angola. 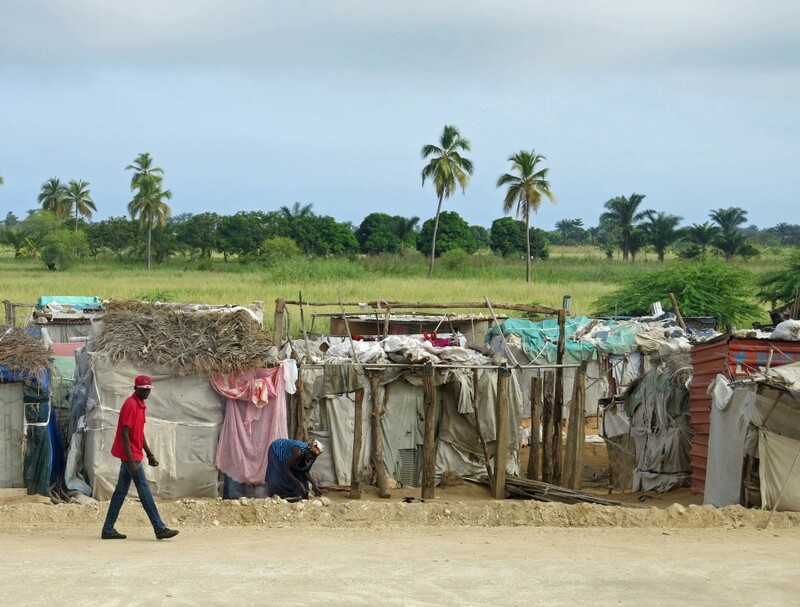 A man walks a roadside in Angola. 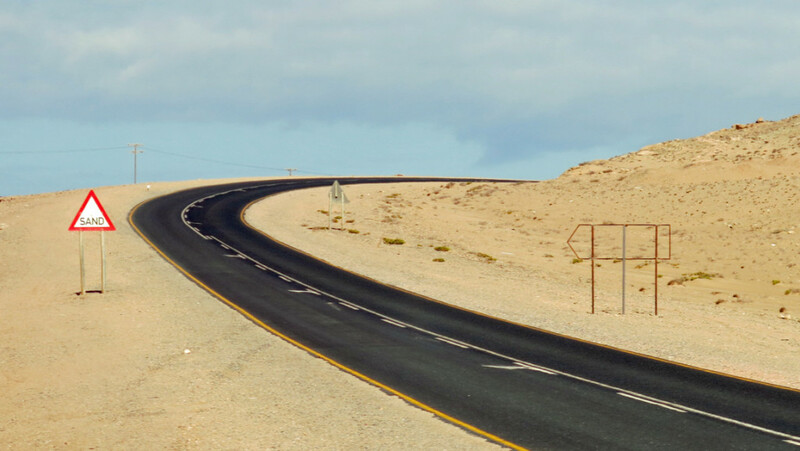 On the lush southwestern coast of the African Continent, the German influenced country of Namibia is an anomaly. 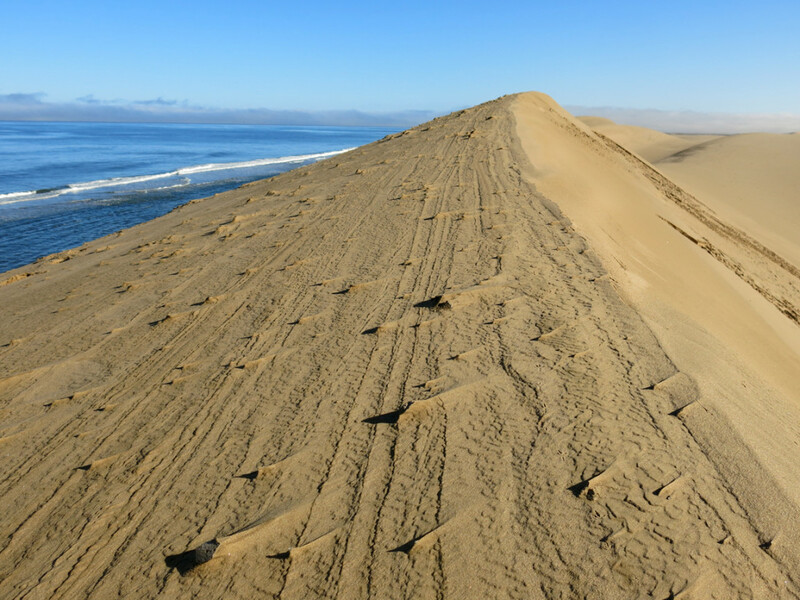 Two thousand kilometers of dry, uninhabited, dune-laden Skeleton Coast is neighbor to one of the world’s most productive and nutrient rich stretches of ocean on the planet. 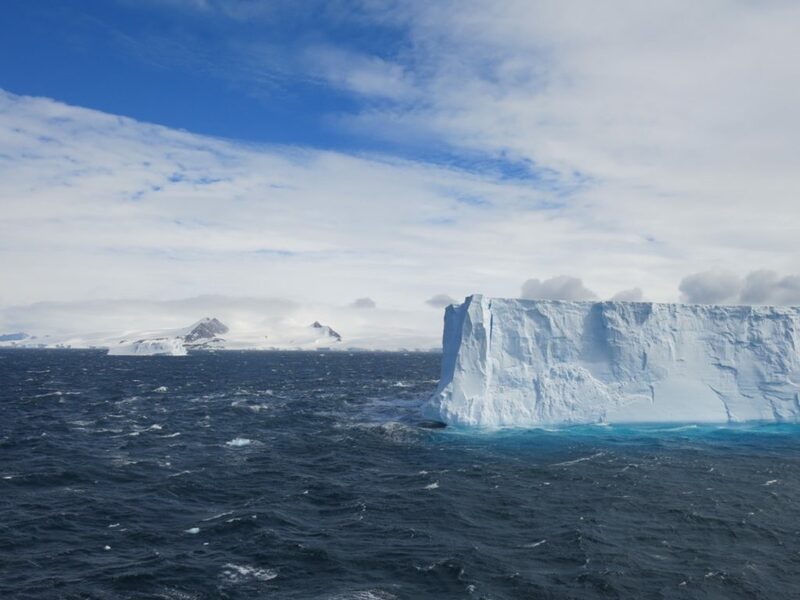 Here the cold Atlantic is fed by Antarctic currents and keeps the landscape at a steady, cool temperature through most of the year. 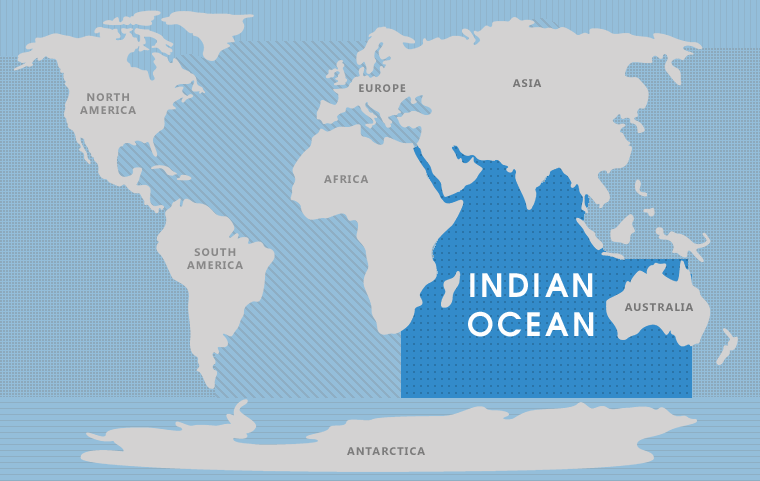 Thanks to cold and nutrient-rich currents, the sea boils with just shy of two million Cape Fur Seals, farmed oysters, dolphins, and whales of almost every imaginable variety. 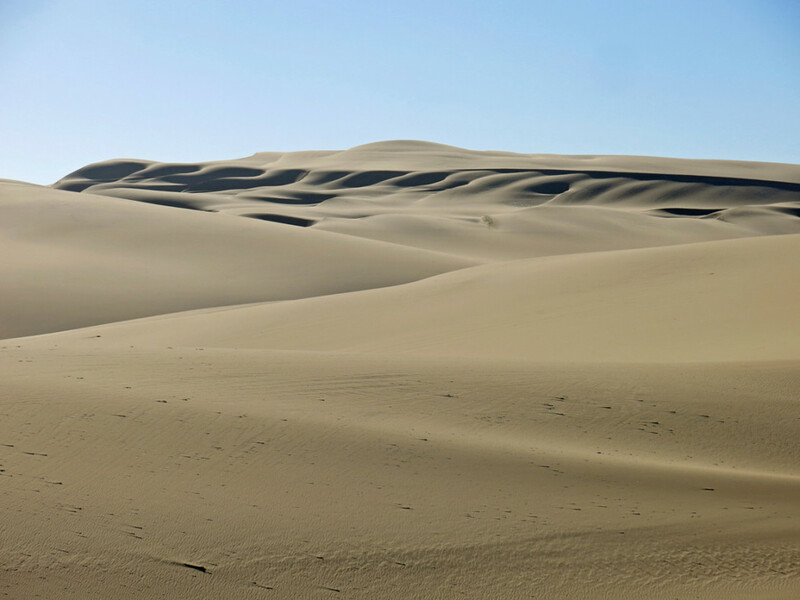 Meanwhile, the land offers visitors the unambiguous contrast of rolling barren sand dunes, low stony mountains and dry riverbeds. Cape Fur Seals on Pelican Point — approximately 2 million of these fur seals live and feast on the Skeleton Coast. The desert is stunning in its own right. The soft curves of the sand dunes piled one upon another as far as the eye can see, and the brilliant contrasts of blue sky, amber sand, dark shadows, and a spattering of green plants all pile together up against the slate grey waves of the cold Atlantic. Fog rolls in and out as a soft, gray vapor and blots the harsh light of the sun for a few hours each morning. In Luderitz, on the southern Namibian coast, our ship docked early in the day and we disembarked in the requisite mist to explore the abandoned diamond mining community of Kolmanskop. A cautionary road sign simply reading, “SAND” met us as the coach turned off the main road and into the ghost town. Never has there been a more accurate warning issued in a place where desert sand is swallowing up the remnants of greed-fueled human endeavor, and encroaching into old buildings and polishing the wooden floor boards of those still in use. It’s hard to imagine that people tried to live here with their water shipped in, packed inside wooden barrels and carted across the expanses to fill old bathtubs that are now abandoned on the sand dunes like claw-footed toboggans. 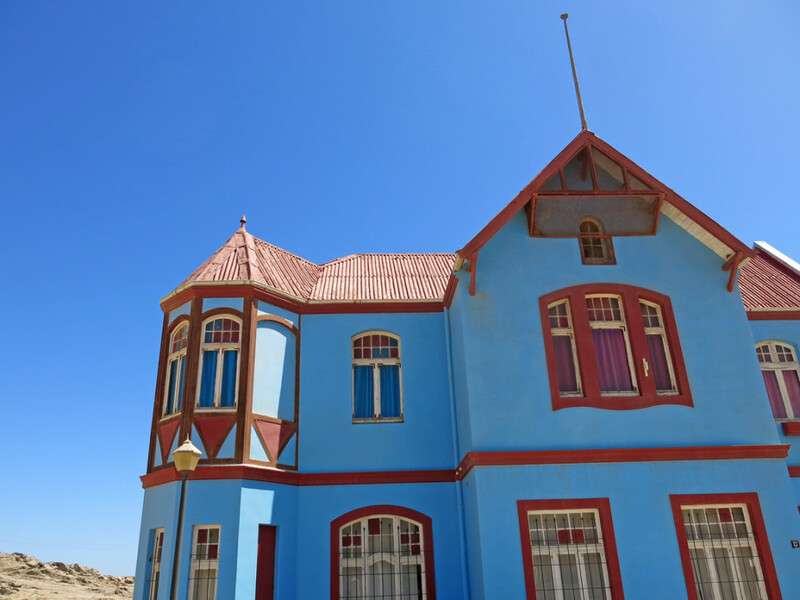 In Luderitz, I was equally enthralled with the colorfully painted German built houses, and the patches of watermelon growing in the desert. While the European architecture seems a tad out of place, so do the melons. 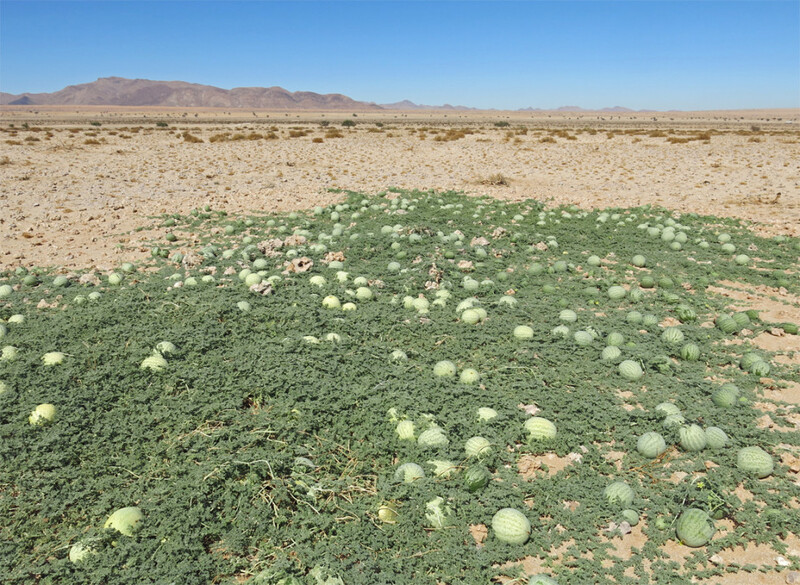 The Kelly green vegetation and mid-sized melons are the last things I expected to find growing in the rocky soil, but there they were, turning sunlight and what little water is around into bitter fruit historically used by Bushmen as a water source. The kudu, gemsbok, ostrich, and springbok of the region apparently prefer to find their water elsewhere, ruling the fruit too sour for their tastes. 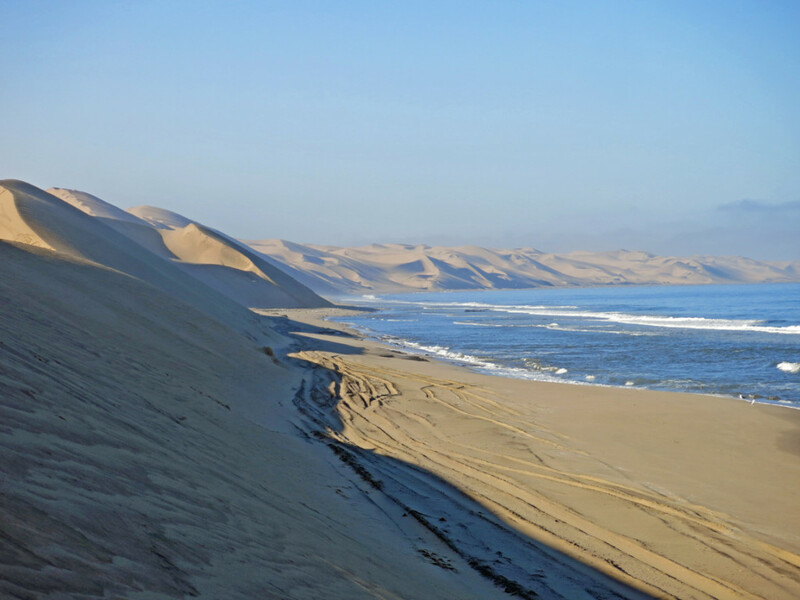 Further north, in Walvis Bay and the surrounding National Park I found hiking up steep dunes to be a difficult and tiring undertaking. Steps must be taken in parallel with the grade and the awkward diagonal trek upwards is impeded by sections of soft, slippery sand in abrupt contrast to packed, dense, firm sections where I could not dig the long edge of my boot into the dune wall, and found there was suddenly little purchase at all. I found speed helped in these situations, and passing quickly over the difficult spots I reached the ridge of the dune where I unknowingly upset the tenuously balanced sand on the inward edge of the dune’s crescent and caused a small avalanche to cascade down on the back side of the dune. Finally perched on the sandy crest, I paused a moment to take in the crashing waves to the west and the rising sun over the rows of dunes to the east. A Cape Fur Seal swimming like a porpoise cruised up the coast just beyond the breakers and out of sight of my companions and our row of 4×4 vehicles down at eye level on the beach. 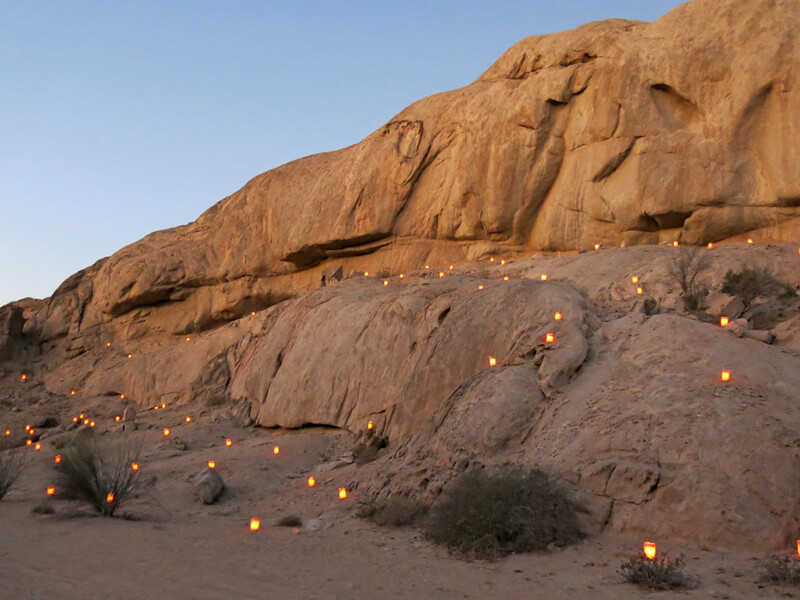 That night we had dinner in a maze of inland desert canyons. Arriving just before sunset I scaled a low rocky outcrop to get out of the canyon’s belly and gain a heady view around the area. The low rocky peaks stretch out around me like cresting waves on the ocean and the low, auburn sun lit up the landscape bathing everything in warm, incandescent light. I did not want to come back down, but was rewarded upon my return with a fantastic feast and a choir of surreal singers. Later the Milky Way erupted as a horizontal streak in the sky – the clarity of which I’ve not seen even under sail on a schooner in the middle of the Atlantic. 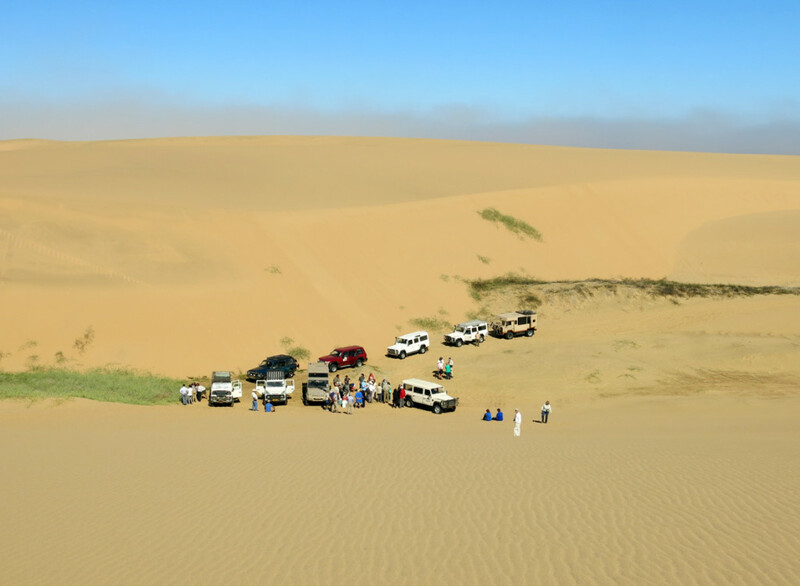 Namibia is a place I hope to return to for its unparalleled and expansive desert that is home to desert elephants and wild horses, and its coasts promising great surf and loaded with marine life, flamingos and giant white pelicans. It was a pleasure to become acquainted – even briefly – with such a special land. ‘Africa’ is a word that has cultivated powerful imagery in the blank slate of my gray matter since childhood. For years, hearing the continent’s name spoken aloud was enough to conjure deep green rainforests alive with the chatter of insects, rolling desert sand dunes sheltering sidewinders and scorpions, lonely wildebeests roaming tree-fringed savannahs, and sprinting cheetahs, lean and panting in the tall, hot grass. 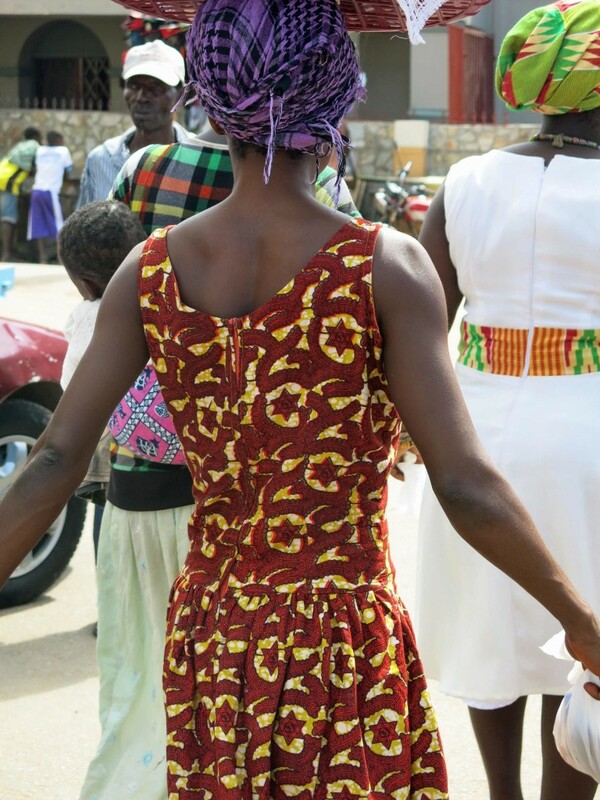 The word also hinted at proud people clothed in colorful textiles, wearing stunning beadwork, towers of metal bracelets, anklets and necklaces, and releasing primal voodoo chants amidst chaotic drumming. My first indirect exposure to the continent came from the contents of my father’s suitcases each time he would return from business trips to Ivory Coast, Cameroon, Angola, Ghana, Nigeria, Liberia and South Africa to name a few of the African countries he visited. I could hardly stand the anticipation as he would lay the hard case on the floor and open the two metal snapping locks, one on either side of the bag’s molded plastic handle, to reveal the bounty of presents within. My dad often brought my mother gifts of jewelry from Africa. I remember a gold cuff bracelet carved with intricate ram’s heads, and I recall polished jade, thick strands of wire-like elephant hair, and brightly beaded bangle bracelets. 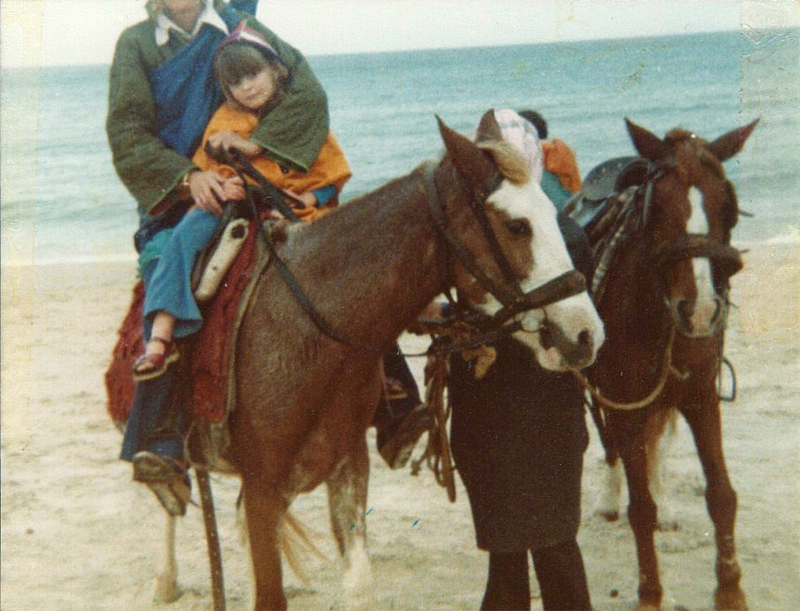 He liked to bring me dolls in traditional costumes. Some were carved from wood, and one was made of cloth from his turban swathed head to sandaled toes. Others were synthetic and dressed like equatorial Barbie dolls. The most exciting acquisitions were always the carved masks he unwrapped from between newspaper sheets and folded dress shirts. I was deeply intimidated by these confrontational embodiments of the dark dimensions of human fantasy. Although, I do recollect one mask that had tufts of hair and a mouth and eyes resembling giant Cheerios. That particular guise was enough to pry a quick smile from me each time I walked by it, mounted high on the hallway wall. My family’s collection of African masks came to a sudden and premature termination when my father determined that not only had he brought home original woodcarvings from Africa, but that he had also imported a wealth of wood-boring insects – including termites – that were not as welcome in the house. So, that was the end of the masks, and the end of my liaisons with the obscure and mystical faces of Africa in the dark passages of my very own home. The only direct claim I have to Africa up until this point of my life was a brief trip I made to Tunisia with my mother in the late 1970s. 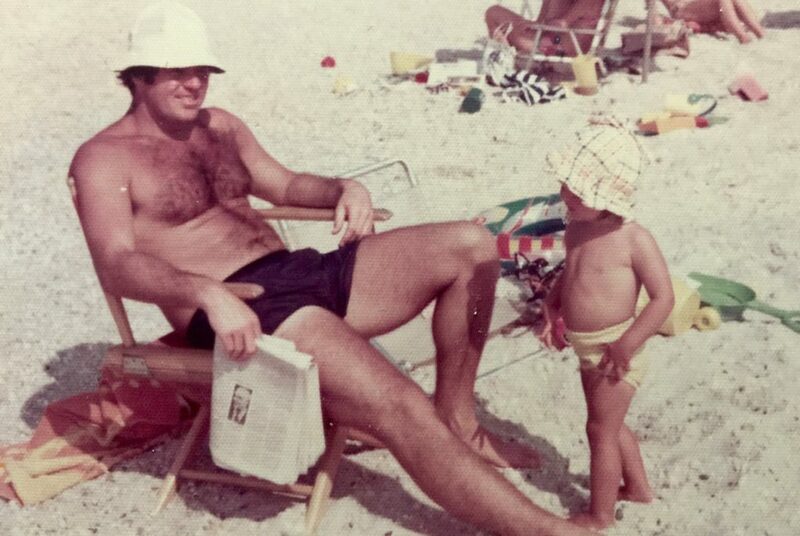 I don’t remember too much of this adventure except playing with the life-sized pieces of the giant chess set near the pool at our hotel, and seeing my mother sip Campari at the empty hotel bar like a person I had not met yet. 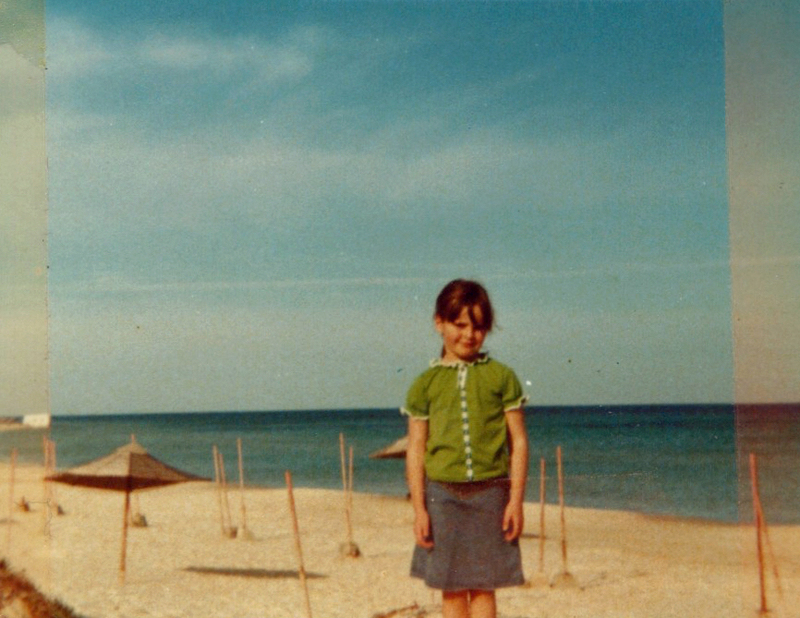 In Tunisia, I was just a kid with my hair in pigtails, wearing bright colors and bellbottomed corduroy pants. 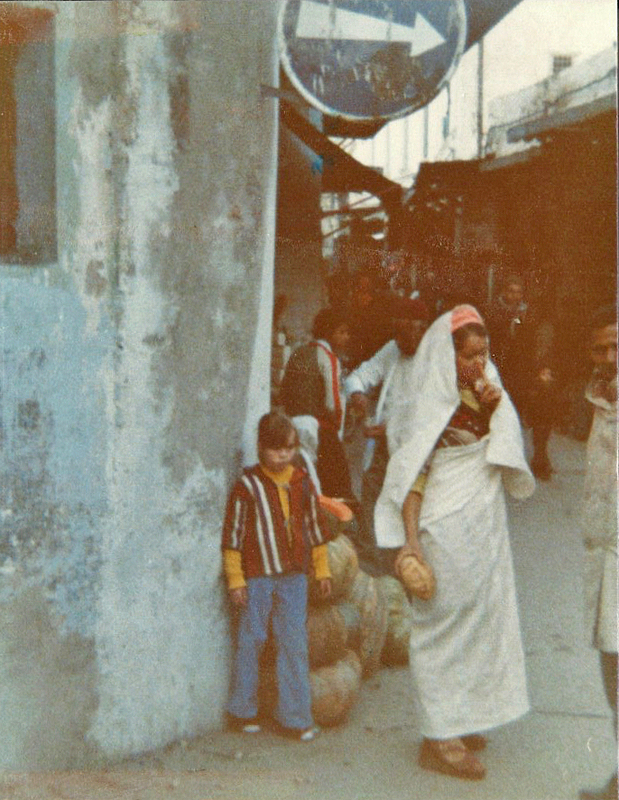 However, I attracted the attention of a couple men in the medina who demanded to know how many camels it would take for my mother to sell me. I was convinced that at some point in the near future, the offers of wealth would be intoxicating and my mom would hand me over in exchange for several dromedaries. As my paranoia reached a fever pitch she had to ask me in all seriousness where she would possibly house a herd of camels in our small flat in London. The logic of that impossibility eventually brought me back down to earth. And here I am, still on the same planet, and in two days I leave for my own encounters with Africa. This time I will not experience the continent through gifts from my dad that merely hinted at the riches in history, culture, and geography. Nor will I visit in the safety of my mom’s shadow as she shields me from wealthy camel herders, holds me tight on horseback (although I was sulking the whole time we rode on the beach because she wouldn’t let me ride a camel instead), or haggles for me in the souk with a vendor for a thick, woven tunic that I then refused to take off. 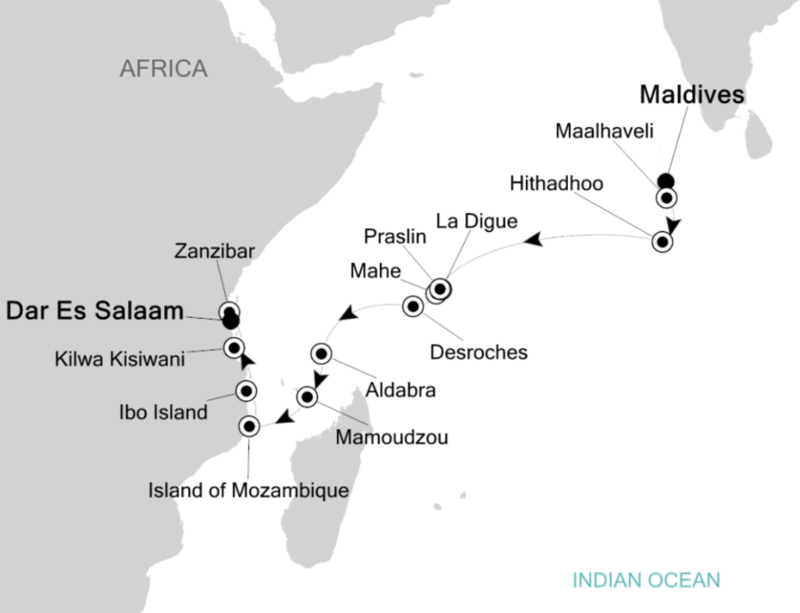 From our small ship I will experience the entire West Coast of Africa from Cape Town, South Africa to Lisbon, Portugal. 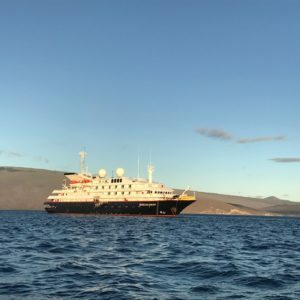 The first leg of the voyage will go from Cape Town to Dakar, Senegal and from this western point the ship then meanders through the Cape Verde and Canary Islands, up the coast of Morocco, and into Europe. 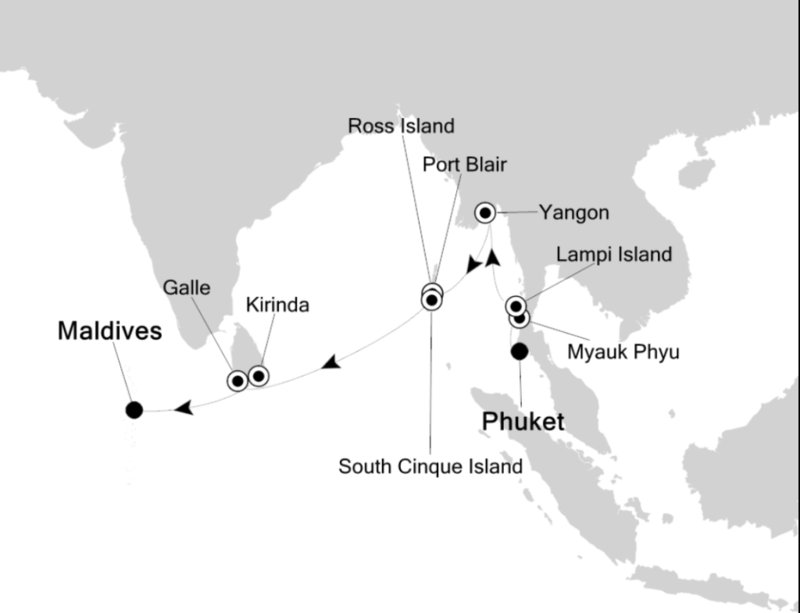 It will be a journey of over 6,000 nautical miles embedded with new sights, sounds, smells, flavors, wildlife and smiles. I hope to write frequently of the experiences and will try to capture the essence of each day in a few photographs to share with you here. Maybe I’ll even bring back a few carved masks – free of termites. 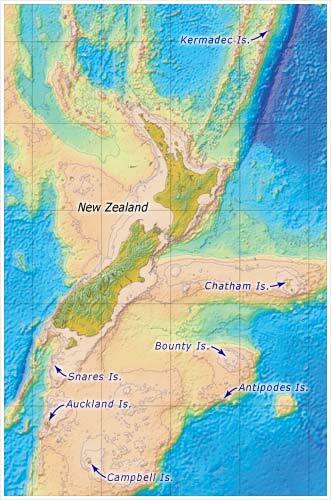 I consider myself lucky to have spent five seasons in New Zealand over the past 10 years. Returning to the Sub-Antarctic Islands for two voyages was a highlight of the summer for me with visits to Chatham and Pitt Islands (far to the east of the country) followed by a clockwise swing through New Zealand’s Subs themselves. 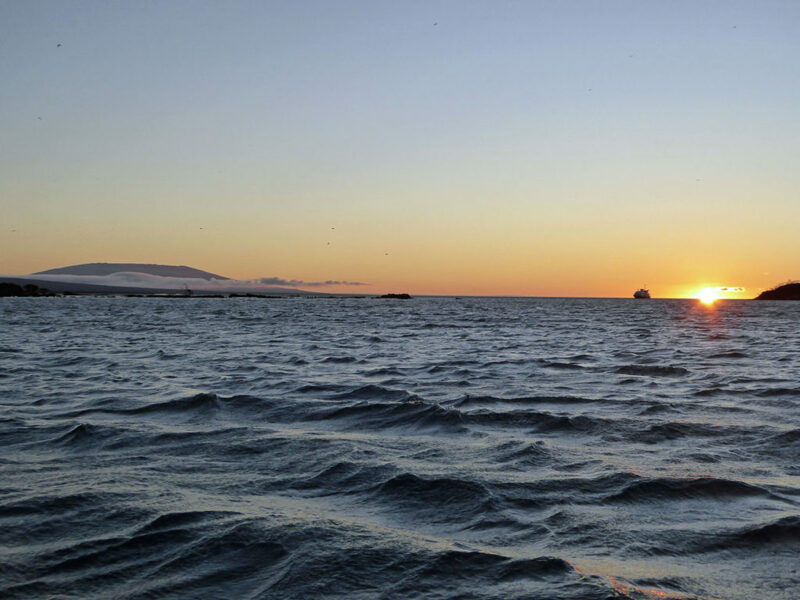 We cruised the Bounty Islands — or the “stones” as our Bulgarian Chief Officer appropriately referred them — at sunset. 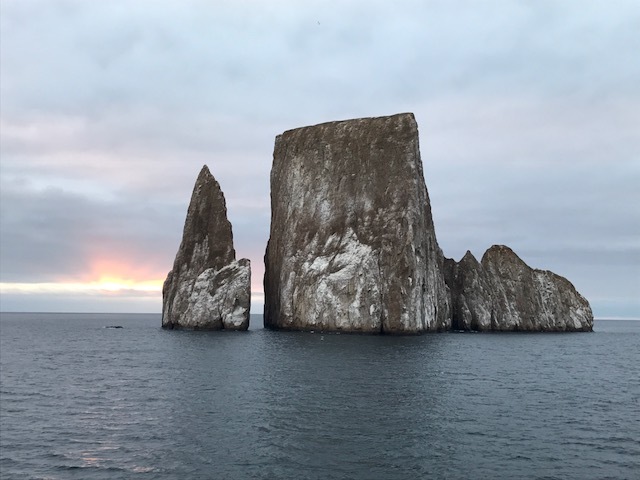 Swarms of albatross hovered over the bare rocky pinnacles on a stiff wind blown through lemon-yellow skies. The Bounty Island Group at sunset. 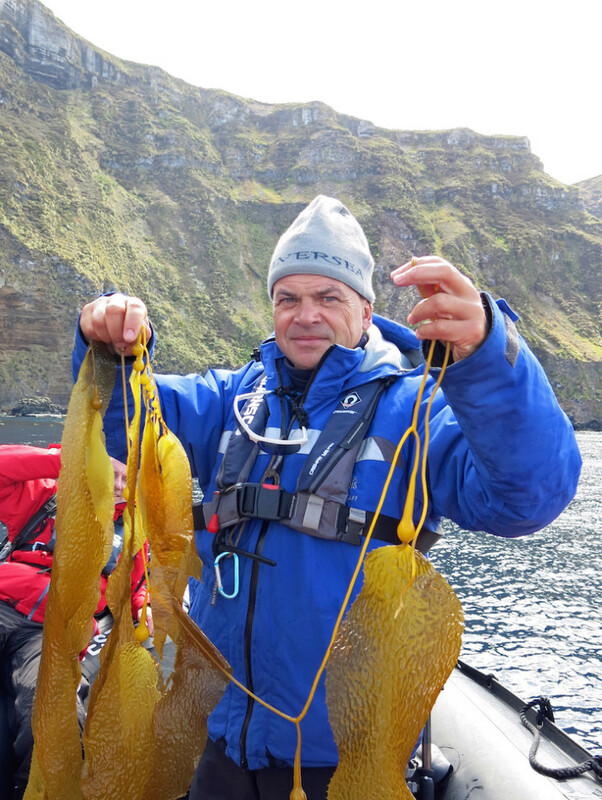 The Antipodes Islands offered up some phenomenal Zodiac cruising. 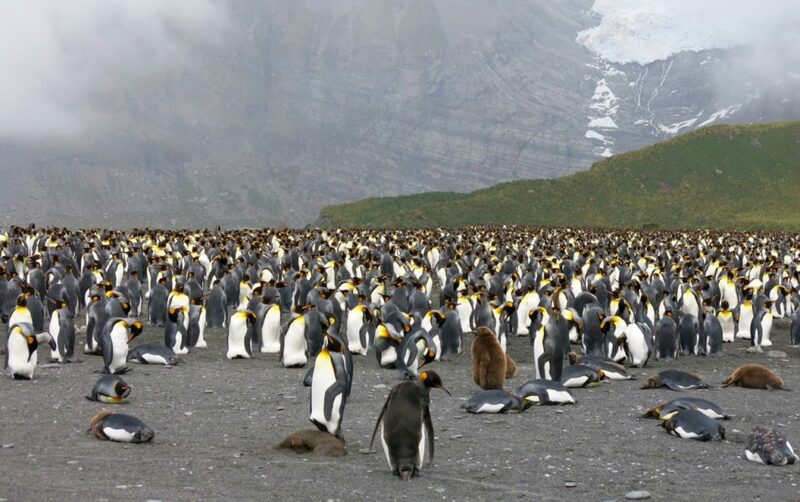 The shores were harboring elephant seals, New Zealand fur seals, the odd Sub-Antarctic fur seal, and masses of Rockhopper and Erect-Crested Penguins. 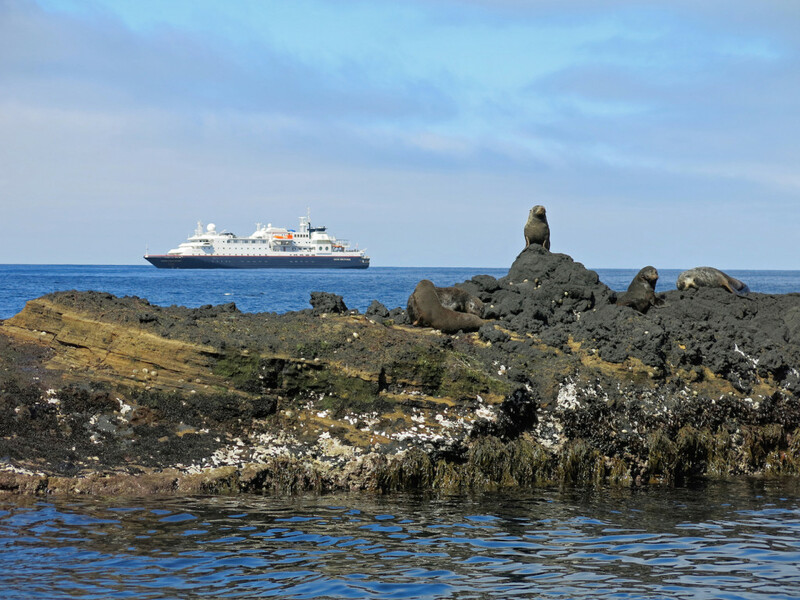 Zodiac cruising in the Antipodes Islands with the ship and some native New Zealand fur seals keeping watch. Our marine biologist examines a floating kelp strand for signs of life. With the Zodiacs we found arms of kelp, free-floating in the blue, to examine up close for minute epiphytic alga and clinging invertebrates. We also discovered vast caves that swallowed up the boats whole and kindly spit us all back out again. 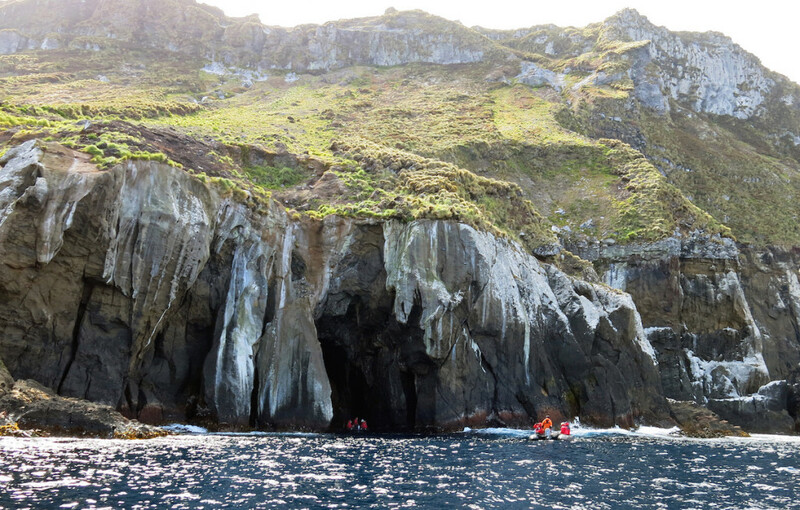 Massive sea caves dot the Antipodes coastline. In at least half a dozen times visiting Campbell Island, only twice have I had the wind and swell and weather conditions align just right. With this trifecta in hand, just days before 2015 drew to a close, we dropped Zodiacs on the impressive and exposed eastern coast of this remote glacially carved island in the midst of the Southern Ocean. 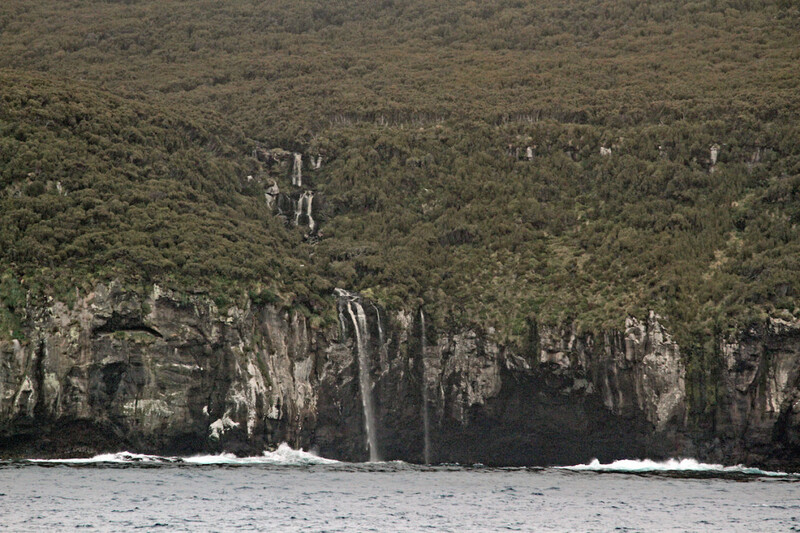 The highly exposed east coast of Campbell Island just outside Perseverance Harbour. 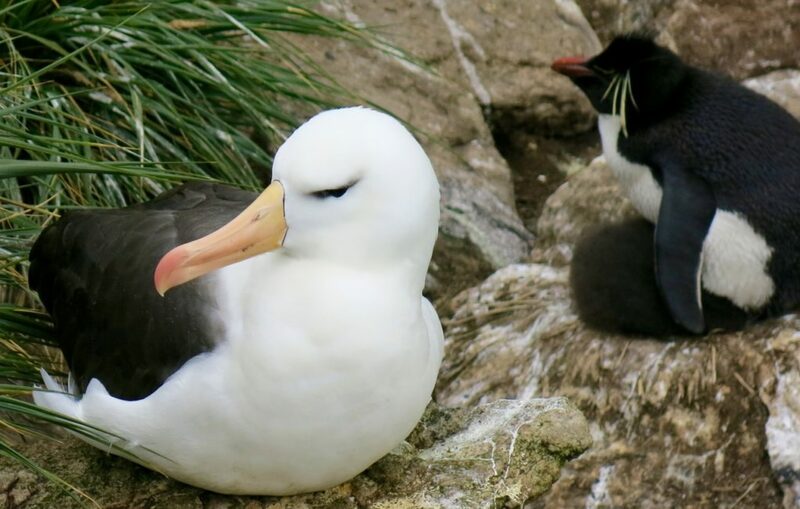 Massive Southern Royal Albatross buzzed the black rubber boats. At first they would approach close to my eye level as I stood at the engine’s tiller with wings horizontal to the water’s surface. 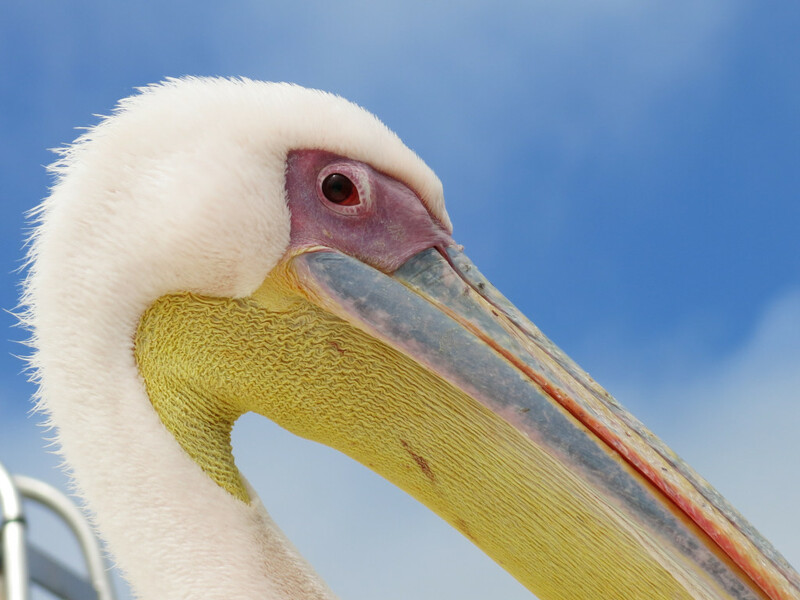 Then in the uplifted breeze close to the Zodiac, each bird would flex its stiff wings to flip from a horizontal to a vertical position in the blink of an eye. Rising vertically like a kite above our heads, the ancient feathered mariners at once displayed the full extent of their massive ~3.3 m (11 foot) wingspan. 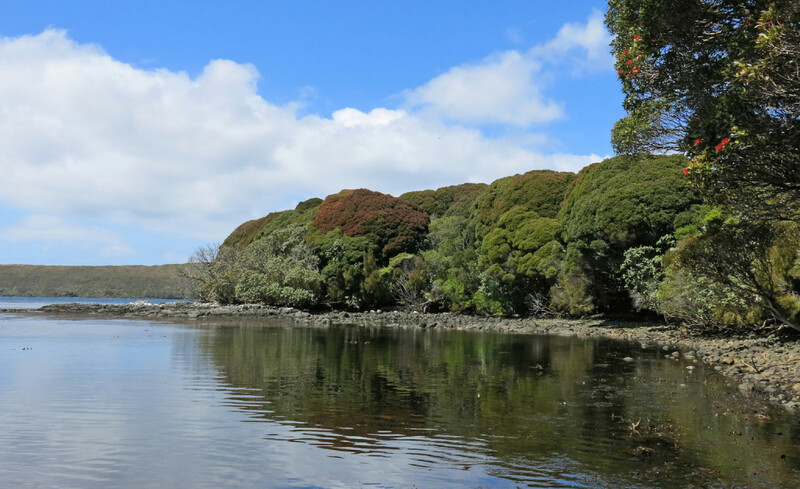 In the Auckland Island group I got to explore a new landing site, one I had not visited before — the lovely old Hardwicke Settlement site on Auckland Island. People made an attempt to live here beginning in December 1849, when three ships from Britain arrived with the brave would-be colonists. 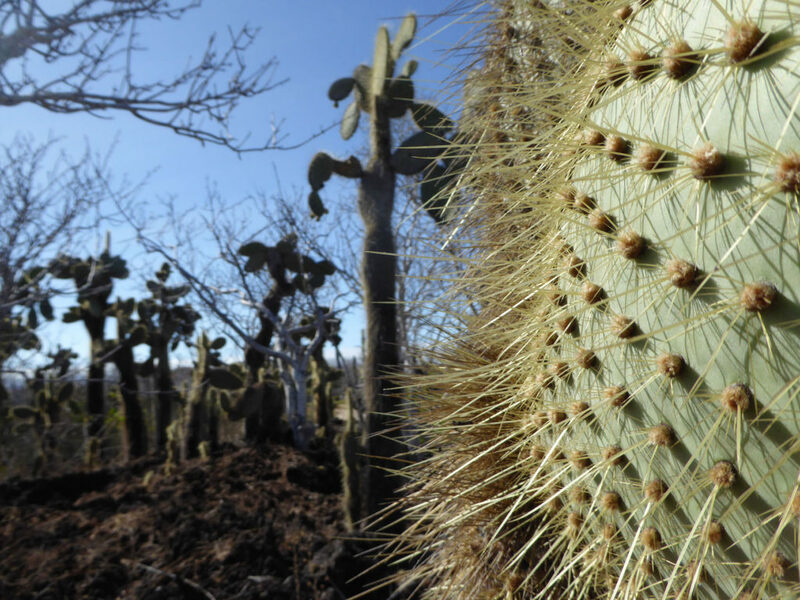 Poor soil, ceaseless rains and thick scrub drove everyone out in 2 years and nine months. Now all that’s left are a few depressions in the rata forest that are likely house foundations and a small cemetery holding the bones of settlers and subsequent castaways. Calm waters in Port Ross at the Hardwicke Settlement landing site. 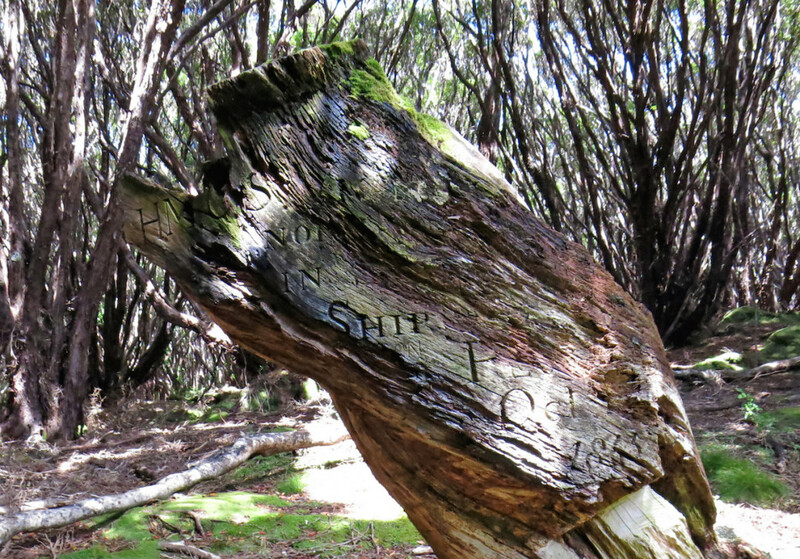 Deep in the forest of the Hardwicke Settlement site is the Victoria Tree carved in 1865 by crew from the HMCS Victoria who were sent to this desolate spot to search for shipwreck victims. 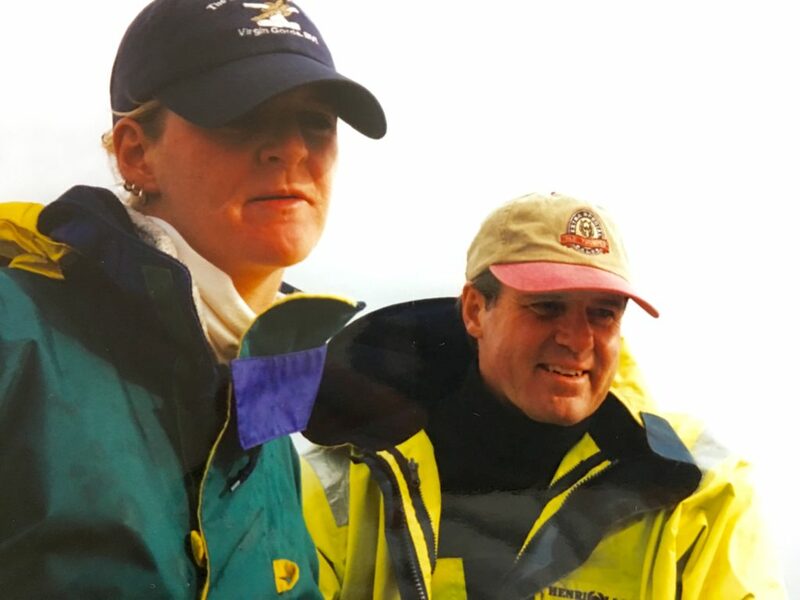 The voyage was a combined effort by the state governments of Victoria, New South Wales and Queensland to try and mitigate some of the loss of life at the time due to wrecks on the Auckland Islands. 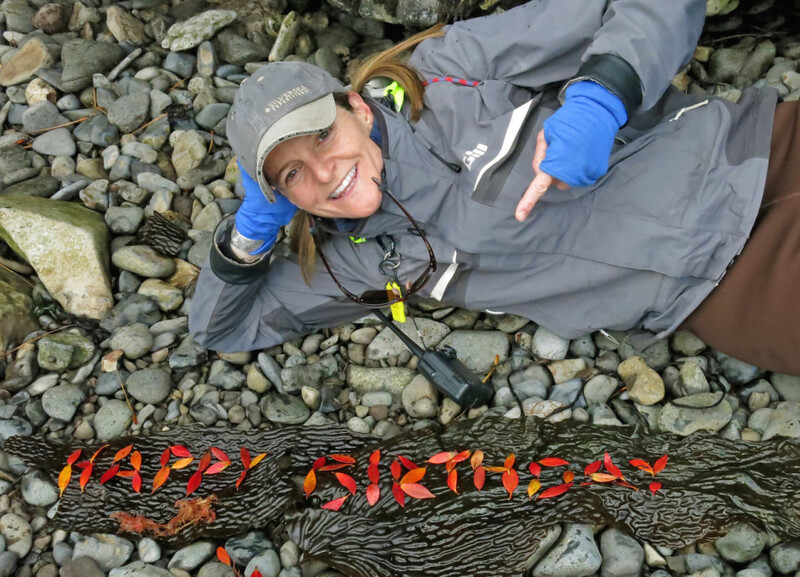 A message of my own from Auckland Island, for my niece on her 12th birthday. 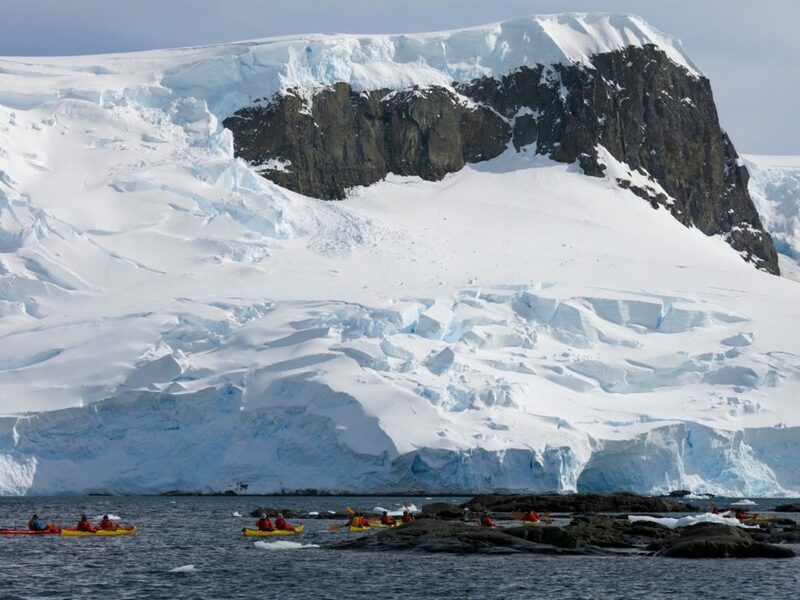 Leaving the Sub-Antarctic Islands following two voyages in and around these Southern Ocean “stones,” I lead two more trips around the North and South Island of New Zealand. 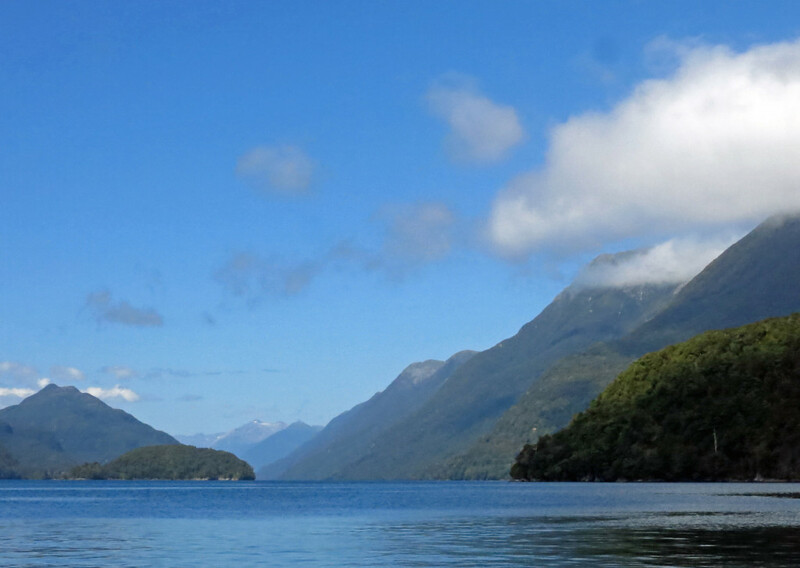 But the cherry on the cake for the season was the three (unheard of) sunny days, in a row, in Fiordland National Park. Seeing the tops of the peaks here is a treat, not to mention hours of streaming sunlight and blue skies. 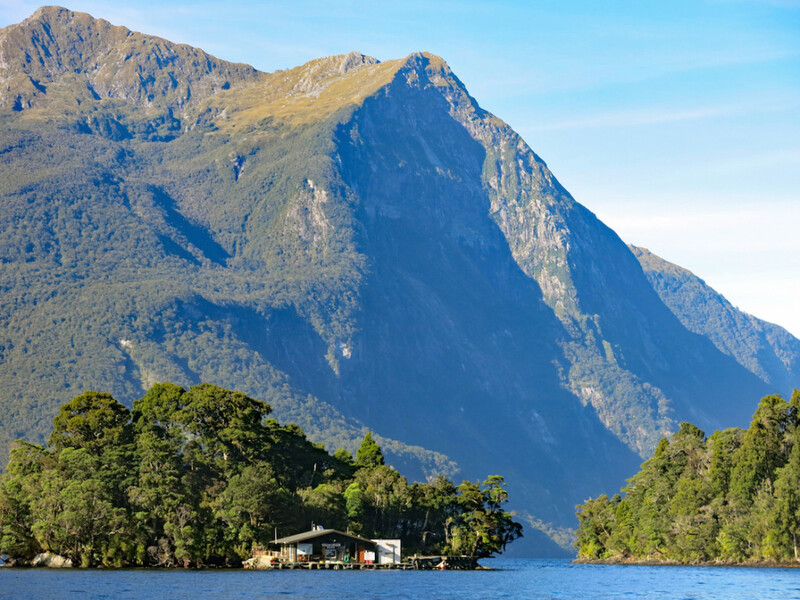 Unreal views past the Blanket Bay Hotel and out towards Doubtful Sound. A fitting send-off for a season of hard-earned smiles, new friendships and stunning scenery. 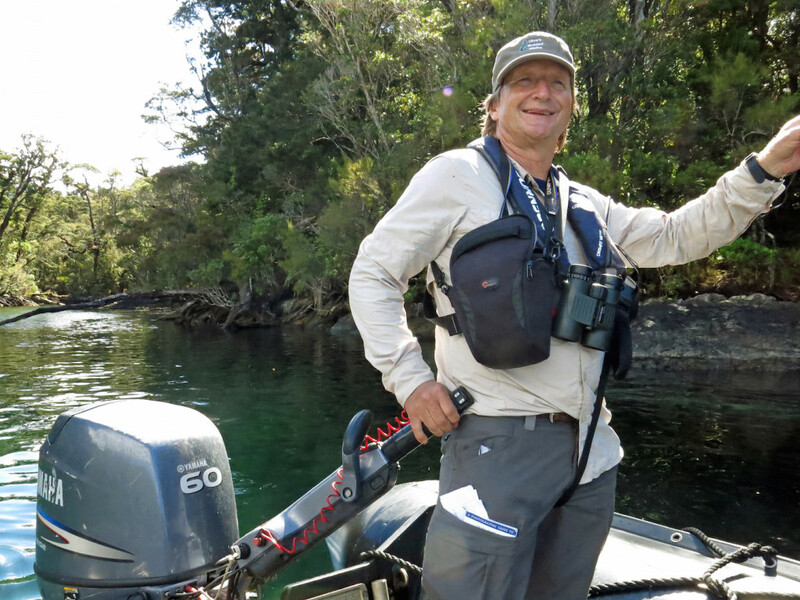 Our “bird-man” hard at work (and seriously geared up) off Astronomer’s Point in Dusky Sound. 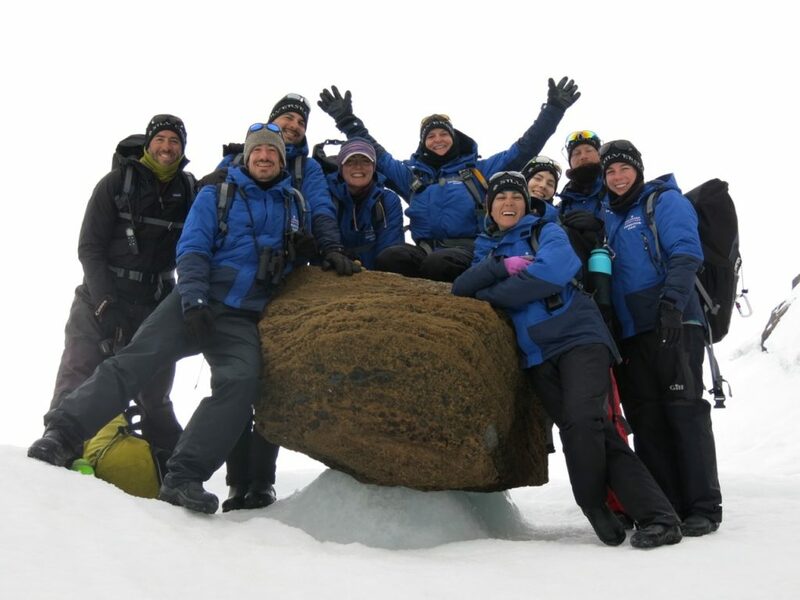 Thanks to the expedition team for a great Season 5 and hope to see you all again some day! 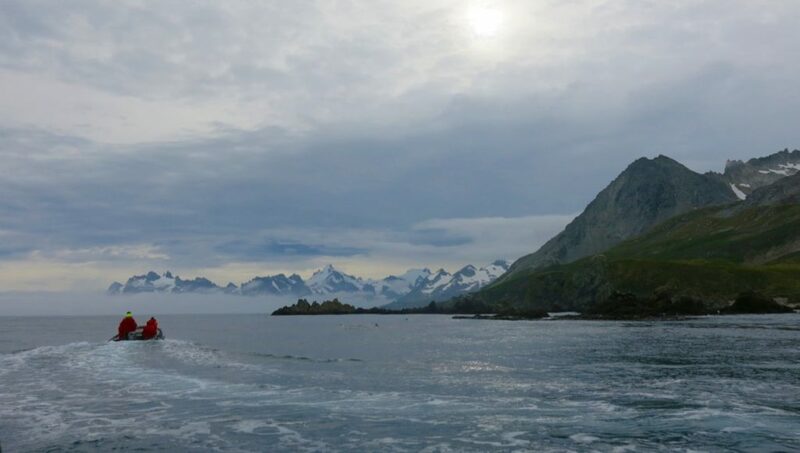 Cook Passage peels away into the distance of Dusky Sound.